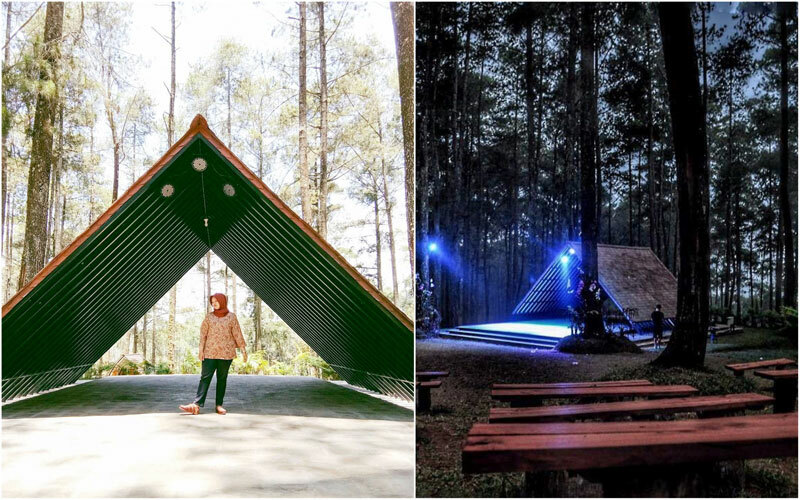 19 scenic and Instagrammable places in Bandung for your family weekend holiday! 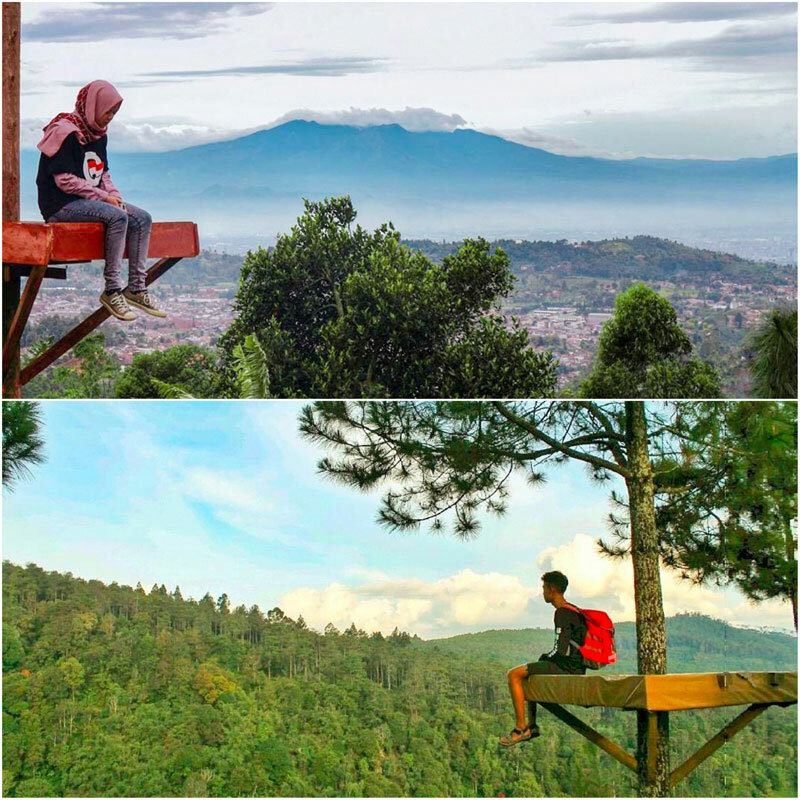 Indonesia > Bandung > 19 scenic and Instagrammable places in Bandung for your family weekend holiday! 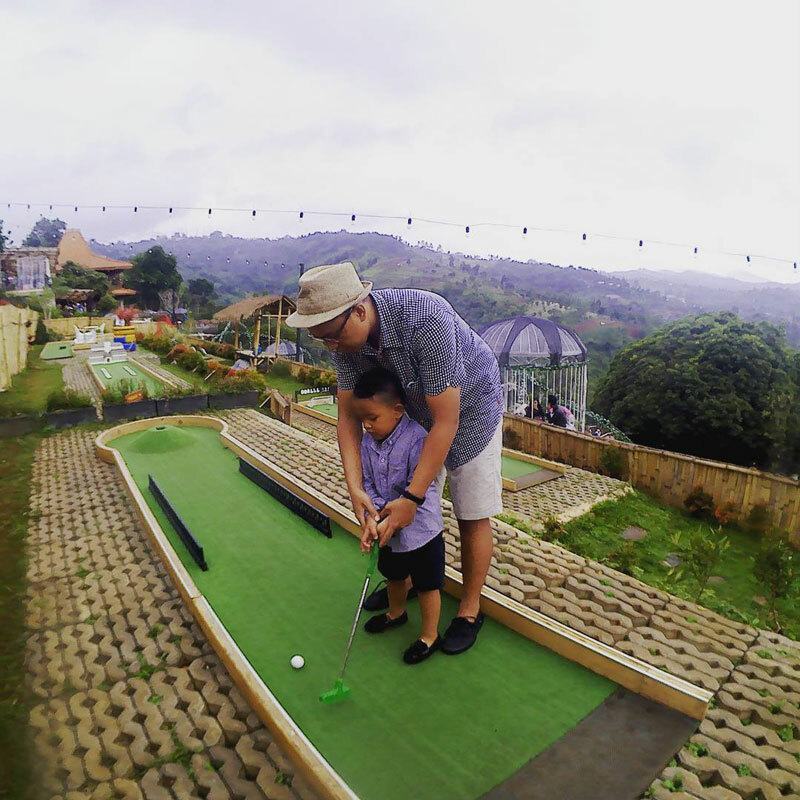 Don’t you wish that your family vacation has more options than just the usual playgrounds or theme parks? Wouldn’t it be great if everyone can actually have fun at the same time? Yep, that means Dads and Moms no longer need to only watch from the sidelines, but can also enjoy every minute of your family time together. 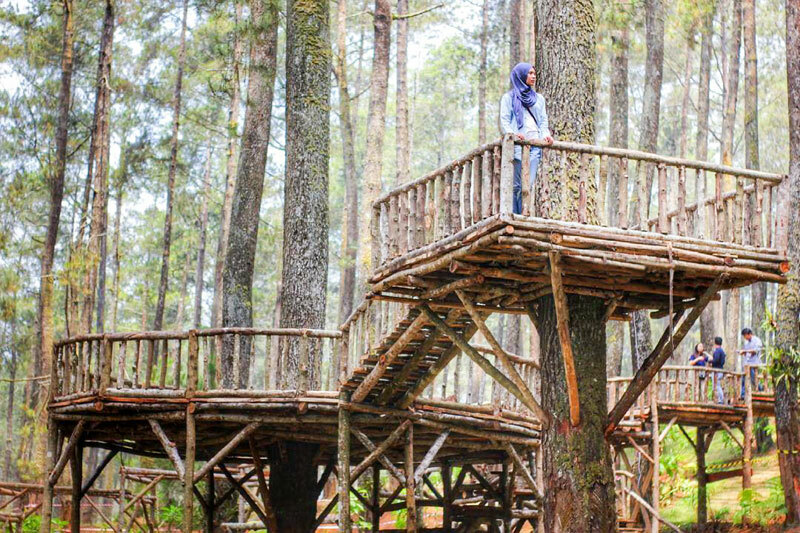 Our latest finds in Bandung can do just that and more! 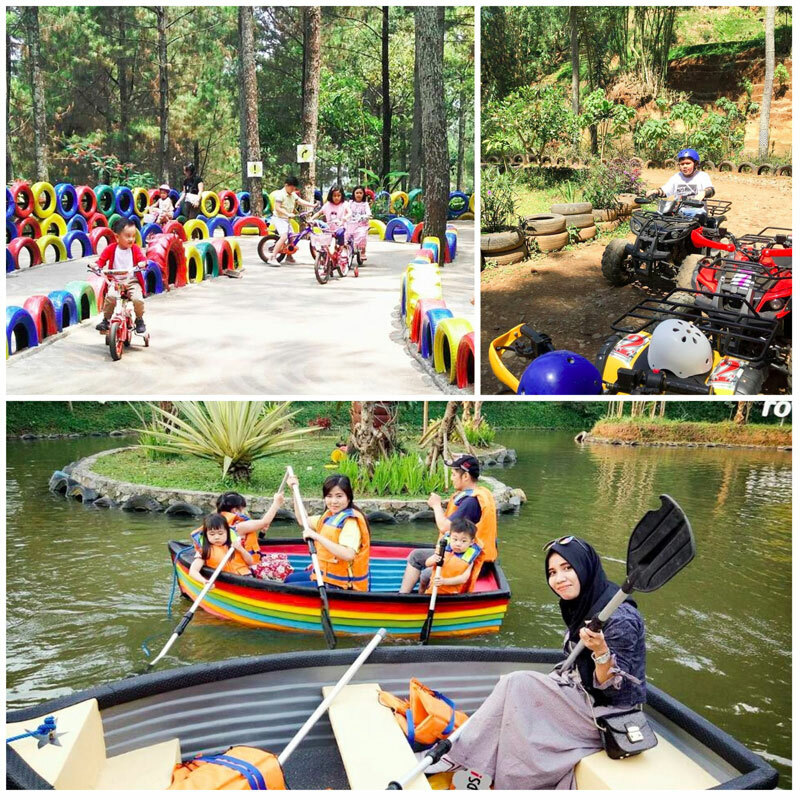 These 19 scenic and Instagrammable places in Bandung are all about family fun – time to unleash your inner child, Moms and Dads! 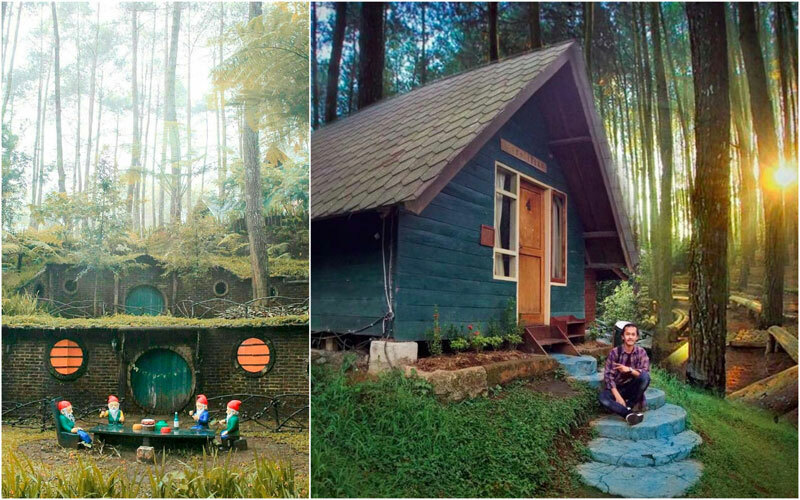 Your kids will love these unique experiences too. Keen to find out more? Check out these trending family attractions! 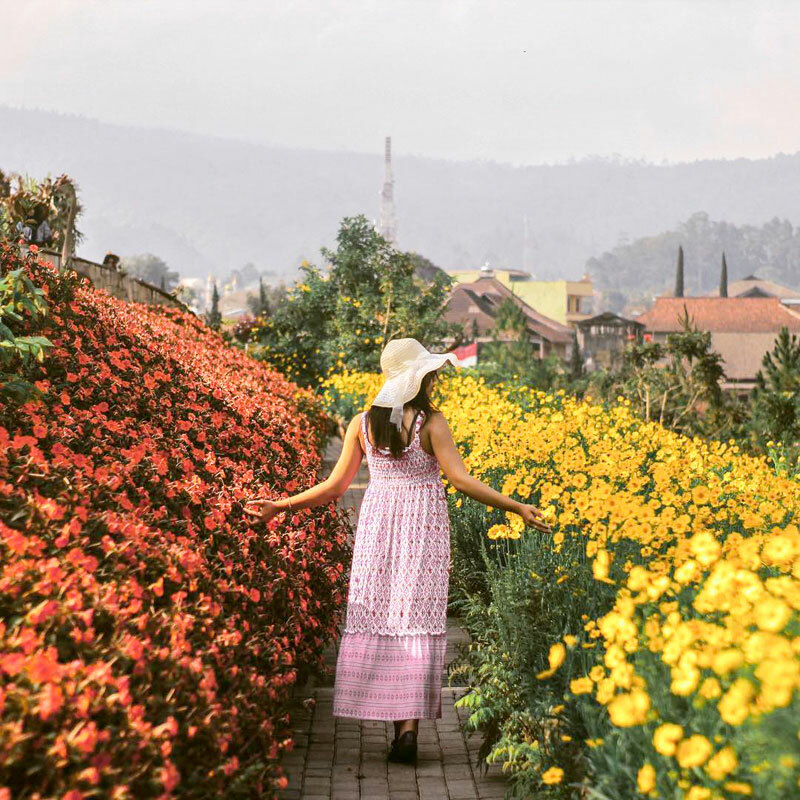 Did you know that you can find beautiful orchid blooms in Lembang? 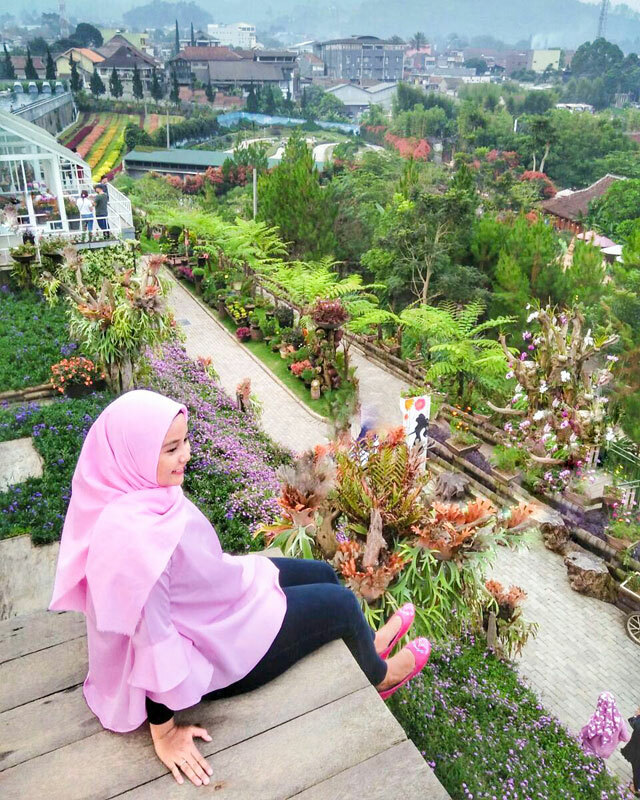 At Orchid Forest Cikole, 157 species of orchids from all over the world bloom and flourish in the cool climate of Lembang, in a beautiful, clean and exclusive landscape. 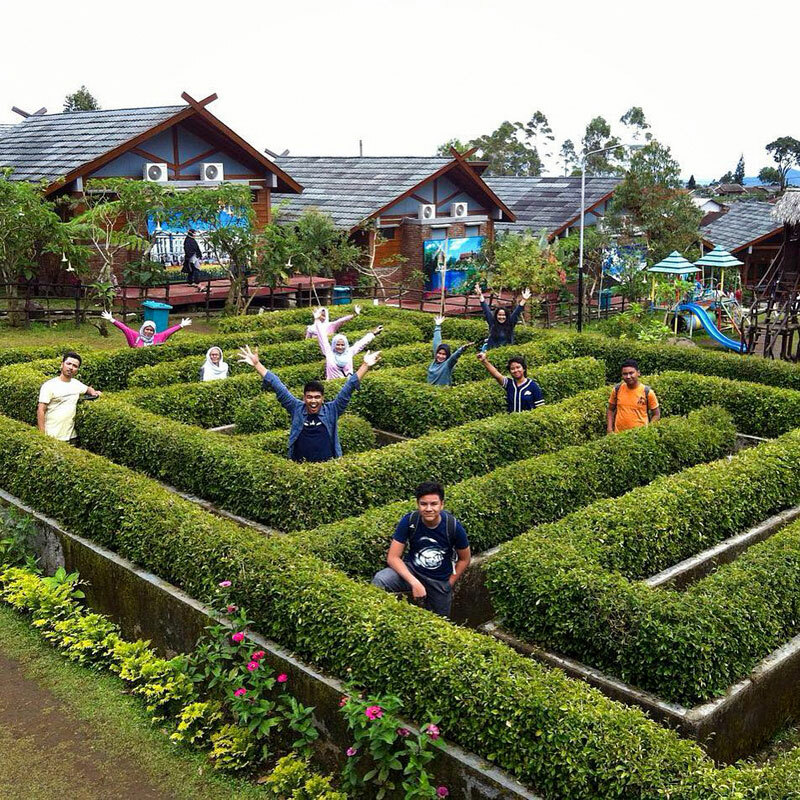 As an orchid conservatory, Orchid Forest Lembang is built for various functions, from the floriculture of orchids to outbound adventures (yes there’s an outbound area) and eco-education. 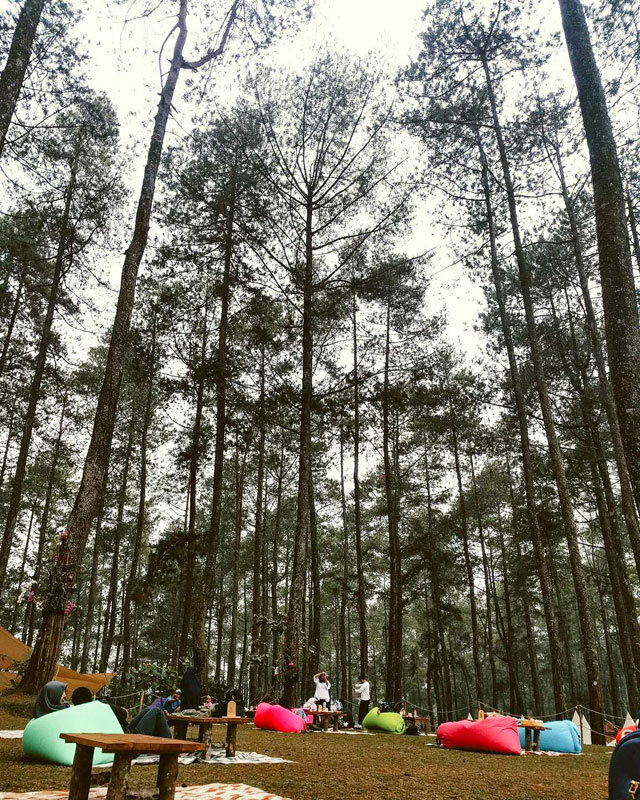 Although this stunning forest is still undergoing several phases of development, you can now already enjoy many of its attractive facilities, such as a coffee corner, an artistic entrance, outbound area, picnic area, playground, reading space for kids and many more. 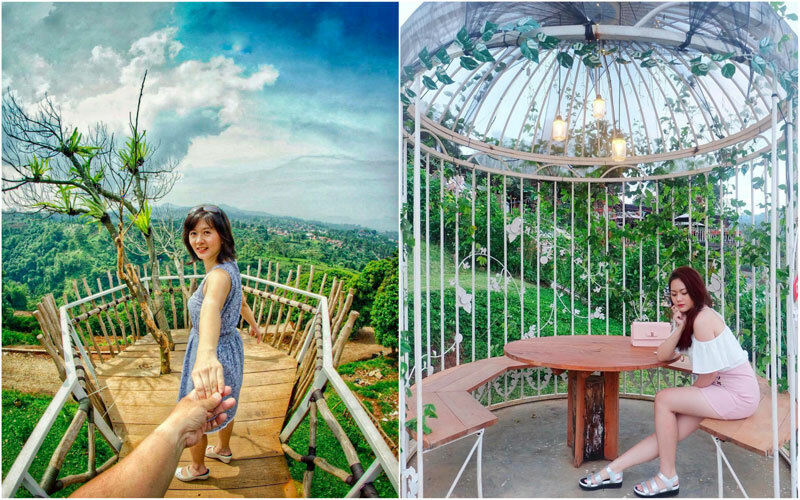 Instagrammers, you’ll love this orchid forest – it’s also dotted with many photogenic platforms you can selfie at while enjoying the panoramic view of the greenery. Just the perfect soul-soothing and refreshing remedy you need anytime! Yep, you read that right! 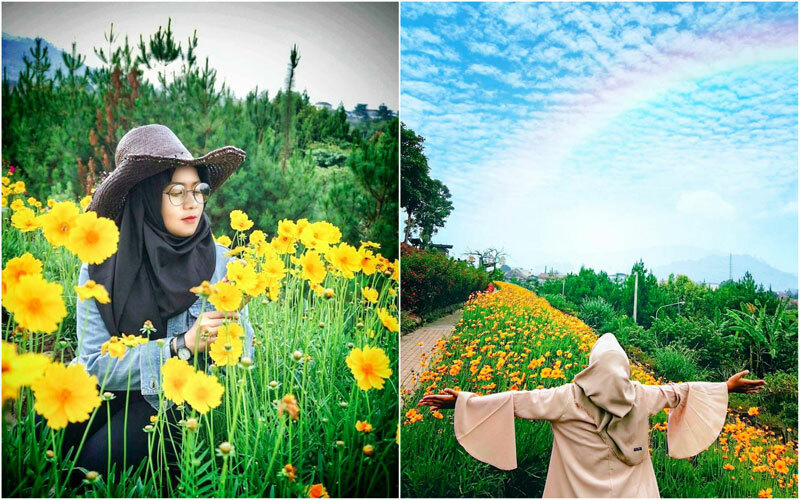 You can actually eat some of the flowers at Rainbow Garden Lembang. 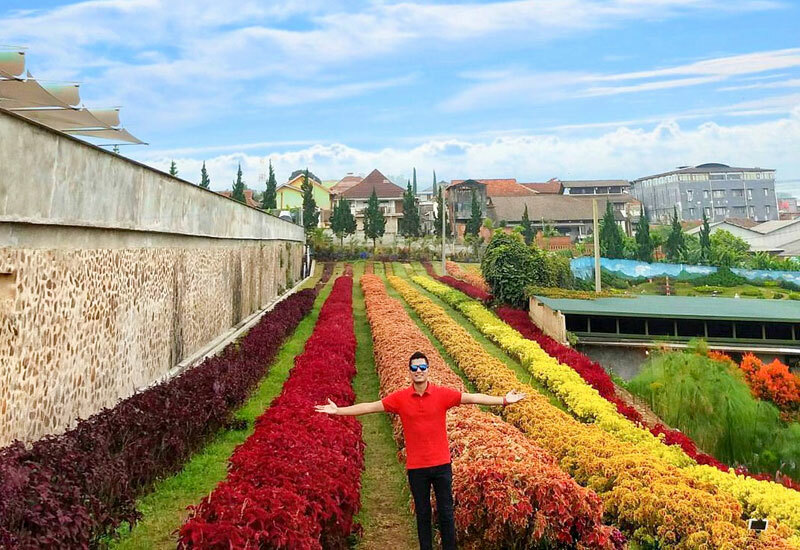 Located in the famous Floating Market Lembang, this garden complex offers a vast collection of over a hundred types of flowers, 80 percent of which are edible! The owner wants families with toddlers to feel safe while roaming in this extra fragrant place, in case the flowers ever end up in their little mouths. 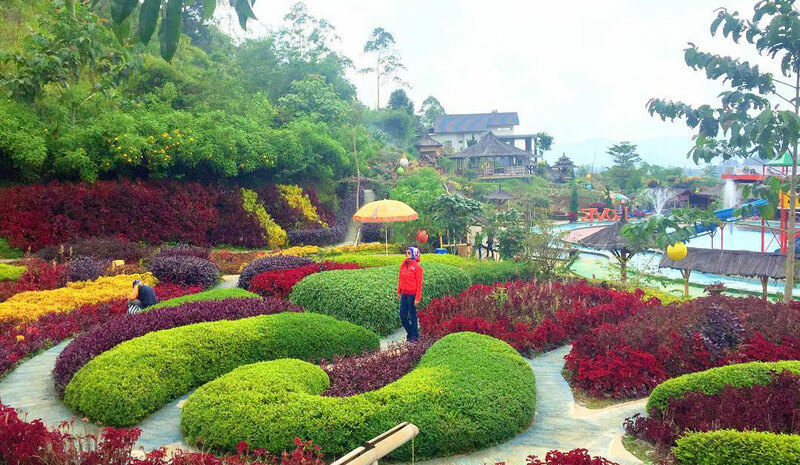 The perfectly manicured Rainbow Garden is also colour-coordinated to resemble a rainbow, thus the name. Besides flower-watching, there is also a flower nursery where you can purchase various types of organic flowers and cactus plants too. 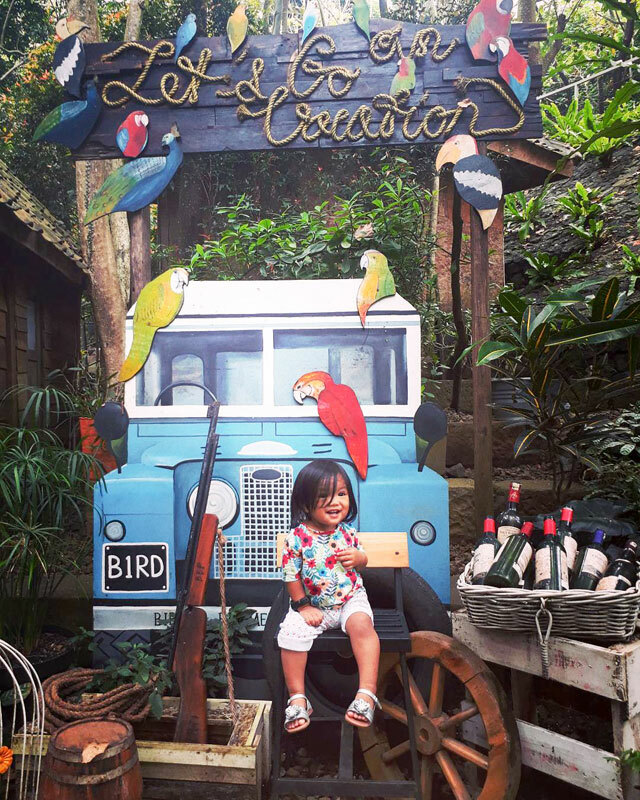 This place is also an Instagram-worthy paradise with quirky decorations, such as vintage swings, old rustic piano, and hanging birdcages in pastel shades. 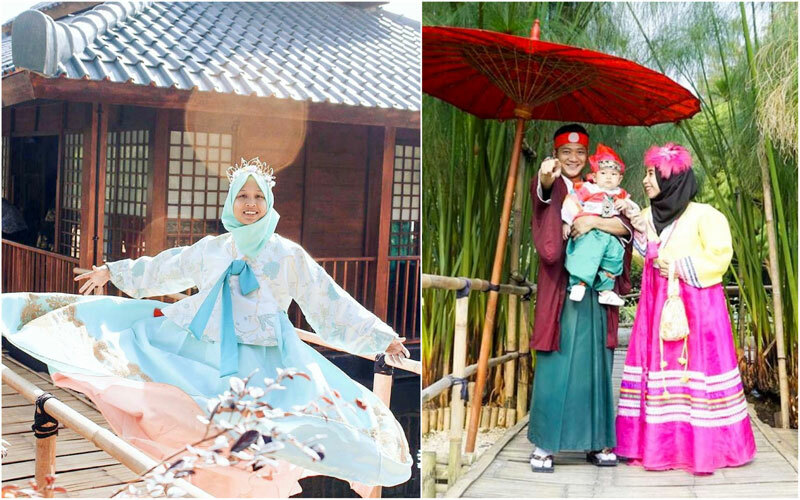 You can even dress up in kimonos and hanboks in the Floating Market, with hair accessories to match! 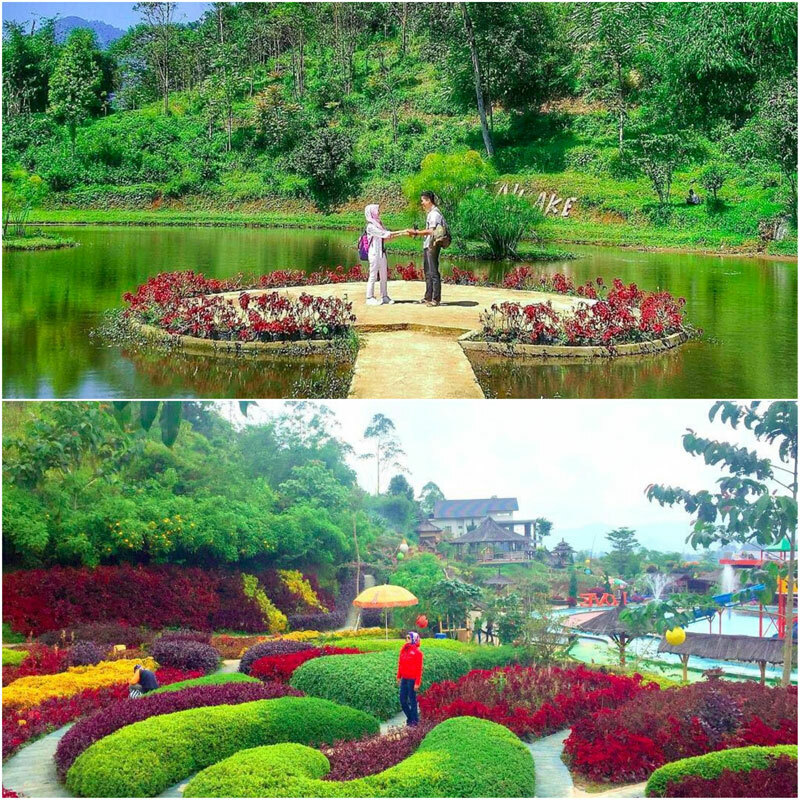 Rainbow Garden Lembang entrance fee (additional): Rp. 10,000 (approximately USD $0.80). 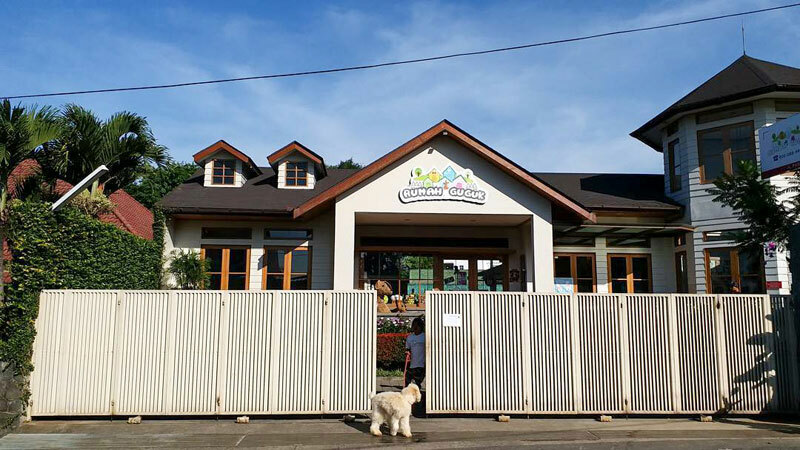 A pet shop where you can play with the dogs, groom your dogs and purchase accessories for your furry friends? 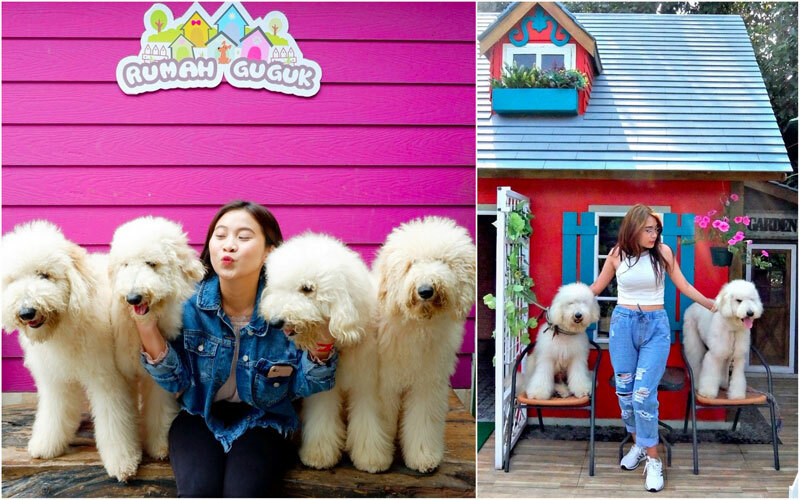 Rumah Guguk is every dog lover’s dream come true! With a glass window at the grooming station, you can peek in as their trained staff expertly groom and style the little doggies. Everyone’s favourite area is located at the back of the house, a lovely green garden with white picket fences and a doggie swimming pool. With no entrance fee required, a step into this place is like entering a dog paradise where they roam, play and swim happily. There are two areas that require entrance fees – one for bigger dogs and another for smaller dogs. They are both equipped with ponds and cute decorations. You can even find sheep and lambs in the bigger dogs’ area! All the facilities and cleanliness just goes to show how thoughtful and well-cared our furry friends are. You’ll be sure to leave as happy as your children! 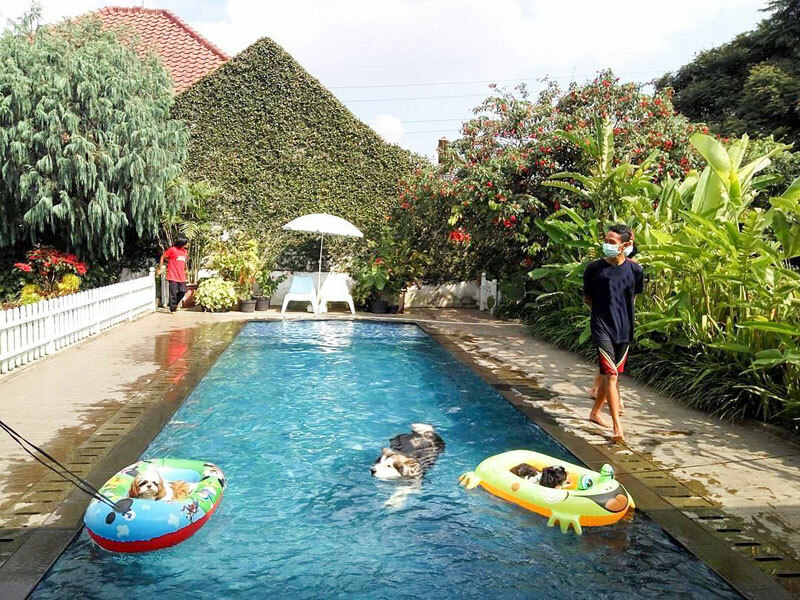 How about some fun family pool time in the cool sunny breeze of Bandung? 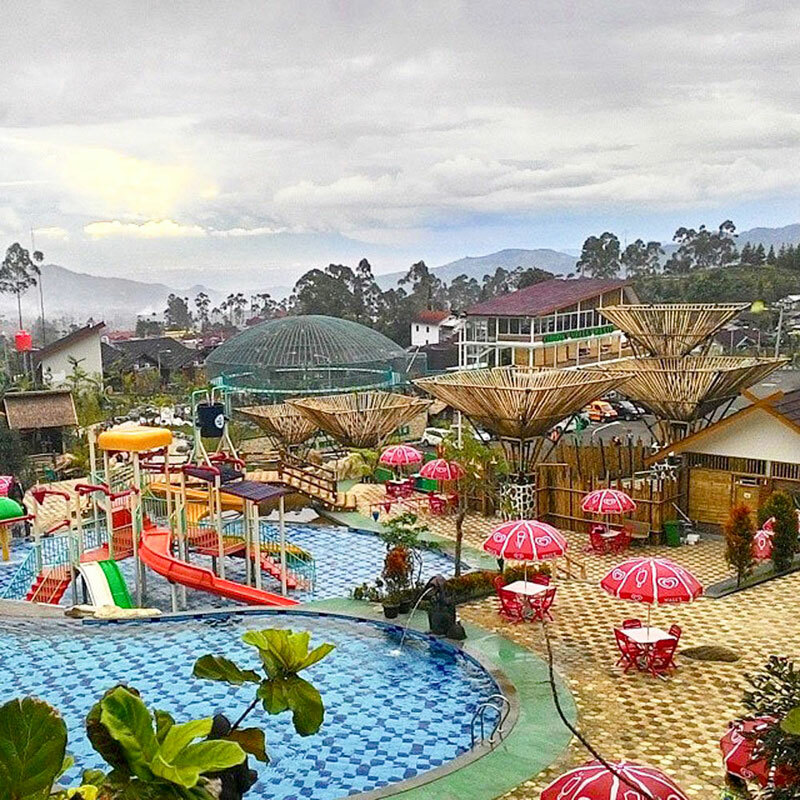 Barusen Hills Ciwidey is every family’s favourite recreational spot where a beautiful pool awaits with an equally magical surrounding panorama. The large pool is equipped with a giant tipping bucket, fountain and colourful slides. 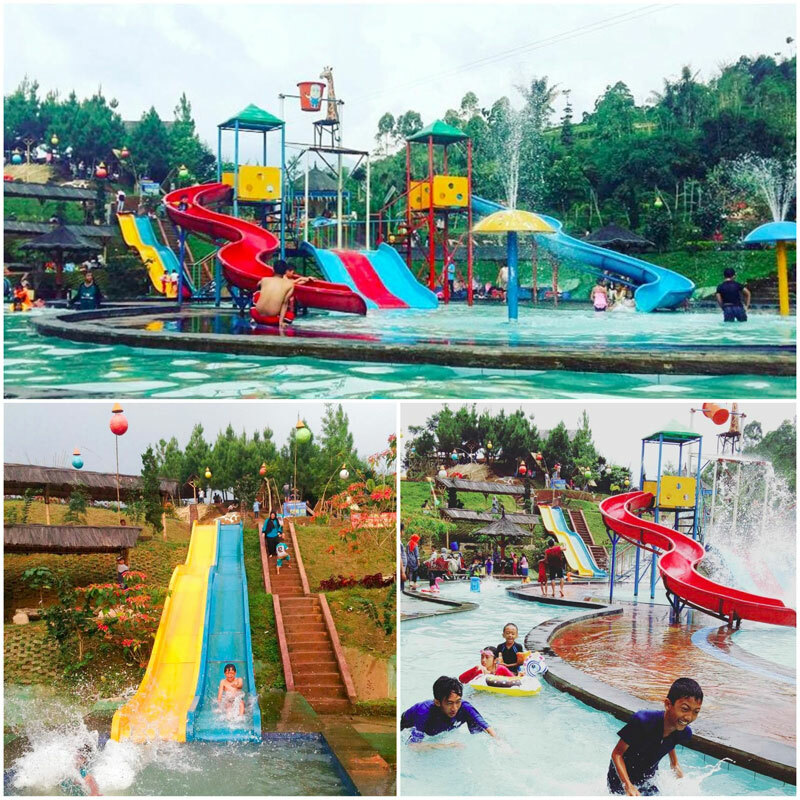 Your kids will love dancing and splashing around in this delightful water playground! 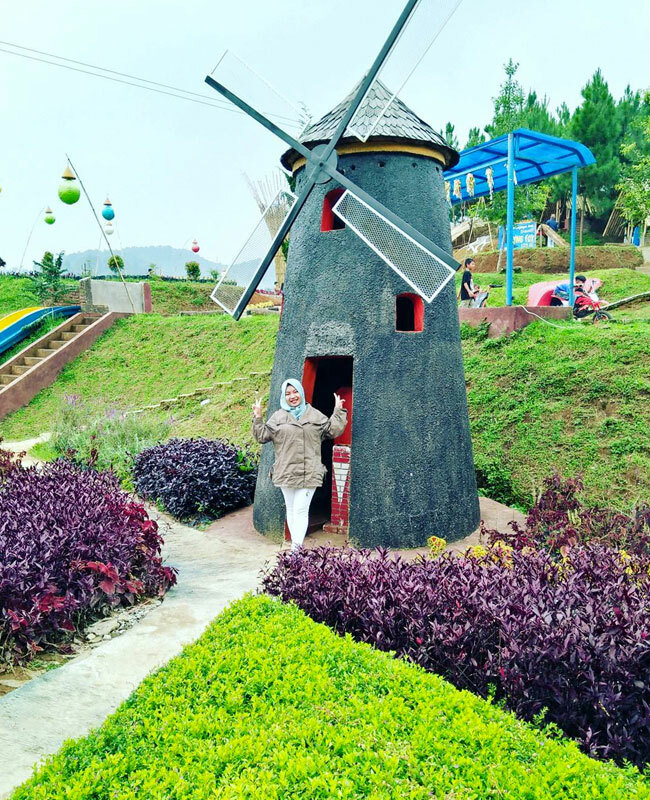 After you’ve had fun in the pool, take a stroll in the photogenic Love Garden, Bamboo Love Garden and Dutch Garden, complete with a big windmill! 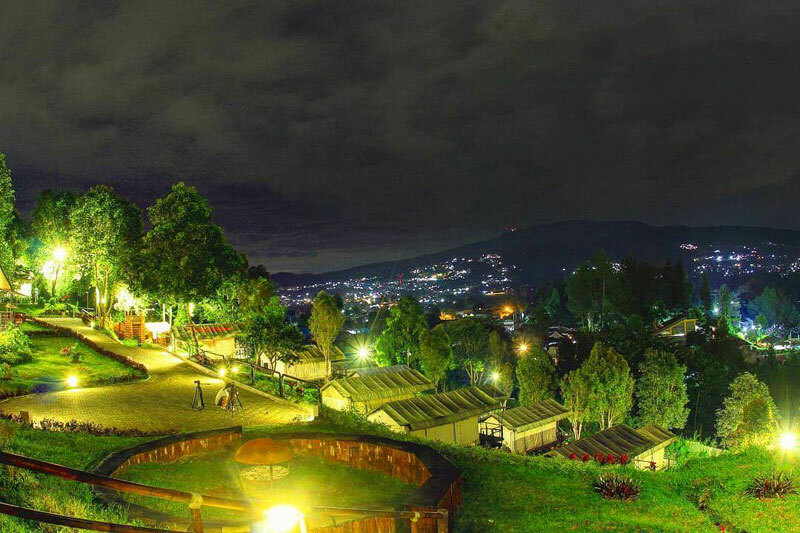 Spend the night if you want, because Barusen Hills also provides accommodation for the entire family. Up for a weekend getaway? 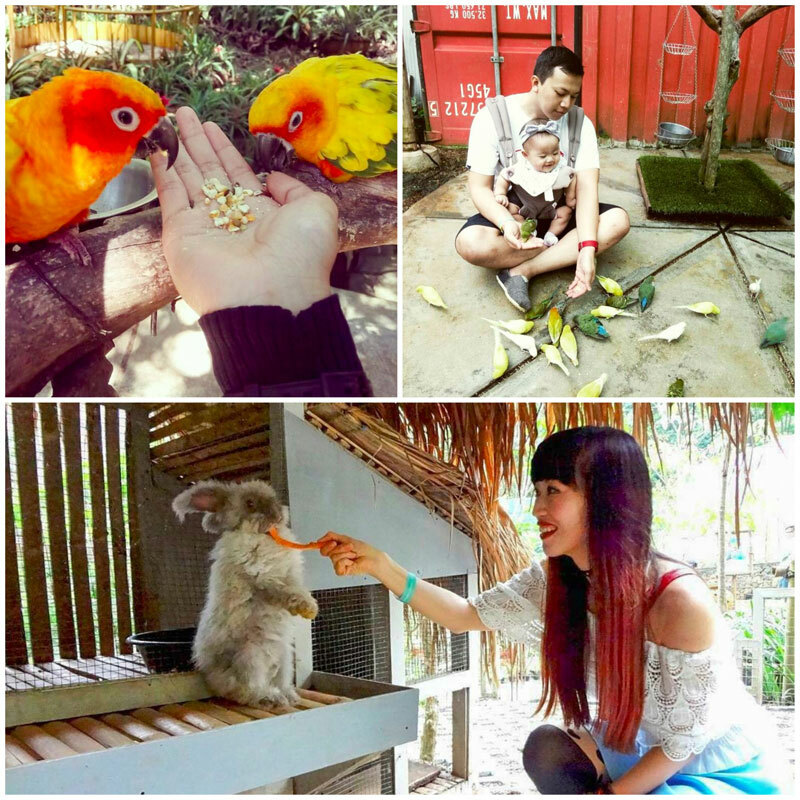 Add some educational fun to your family holiday – visit this mini bird park! 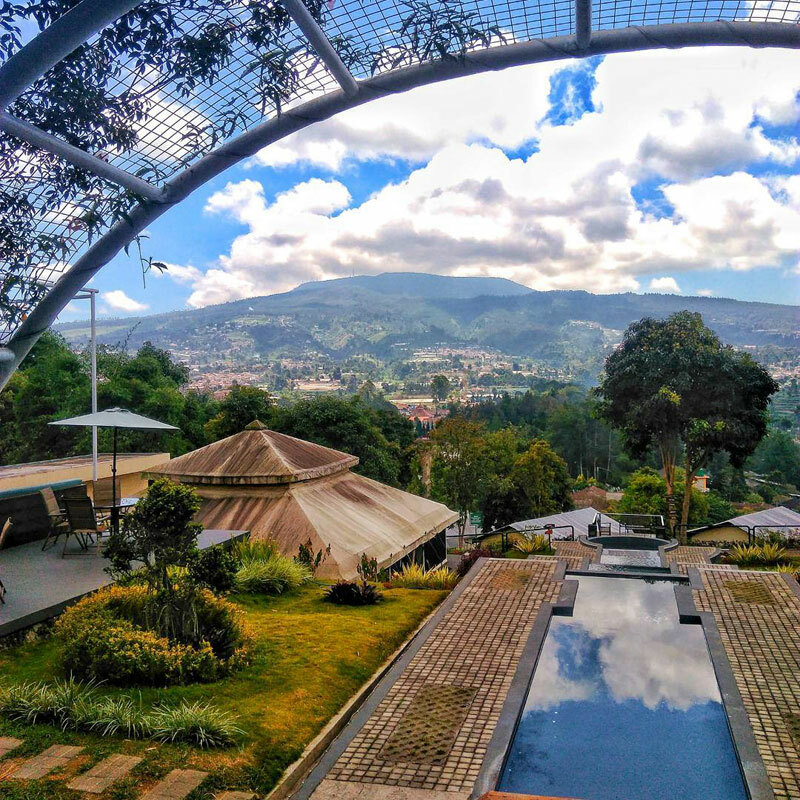 Located in the Pramestha Resort Town, the Bird & Bromelia Pavilion is one of the many attractions here, which include nature, agricultural tourism and a wellness centre. 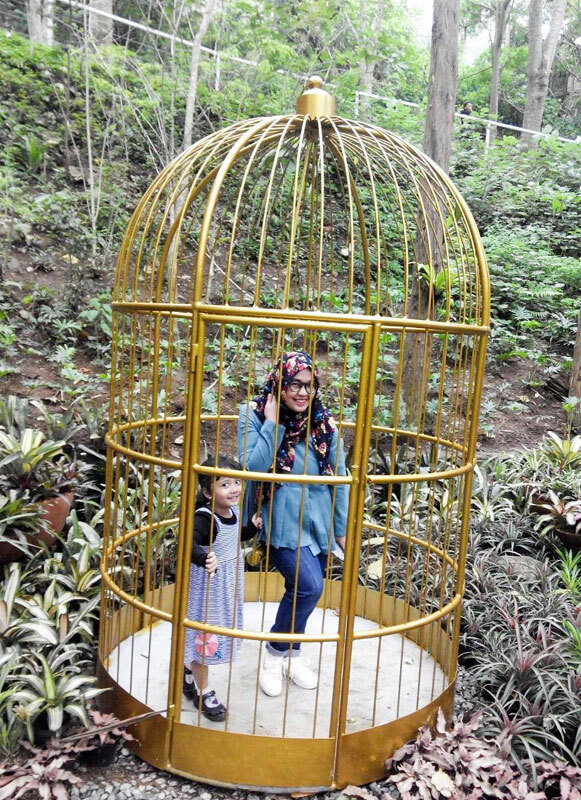 You’ll find a large aviary divided into 5 separate sections, categorised into the different bird species. There are over 600 birds altogether, including some free-roaming ones near the restaurant, which interact with guests under the supervision of the trained staff. 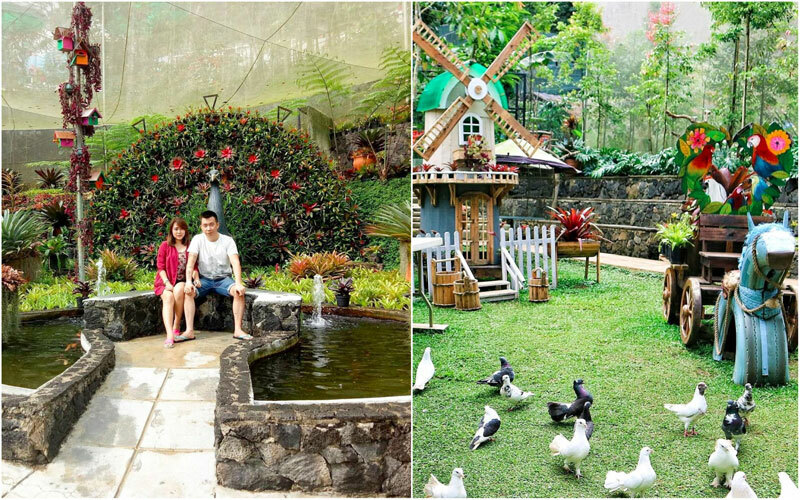 Here, living in the lush manicured gardens surrounded by trees and flowers, you can also find bunnies, swans, peacocks, turkey and fish pond. Isn’t it such a lovely sanctuary for the animals? 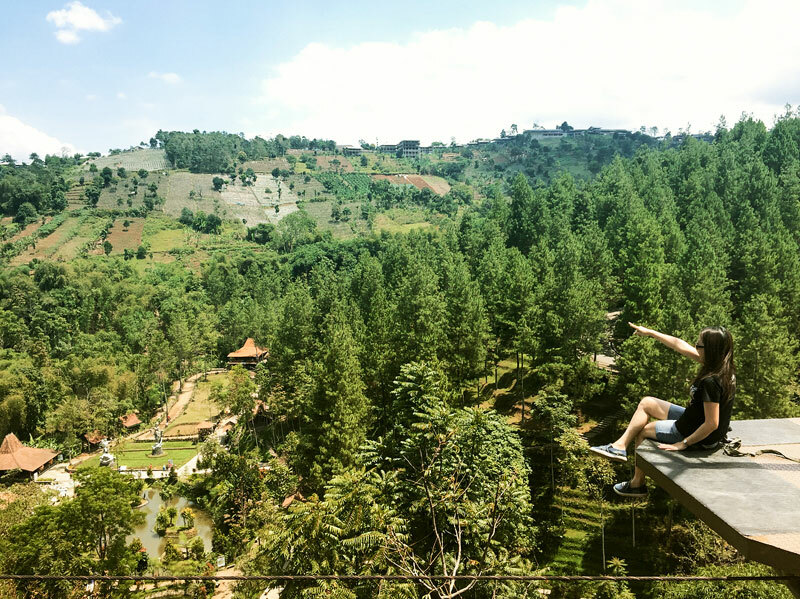 Dago Dream Park is not just any family park,but it is styled with a distinct Balinese nuance that will instantly put you in a relaxed mood. The trees and statues around are decorated with the iconic black and white checkered cloth, while the big bridge entrance above the running river stands steady and proud. 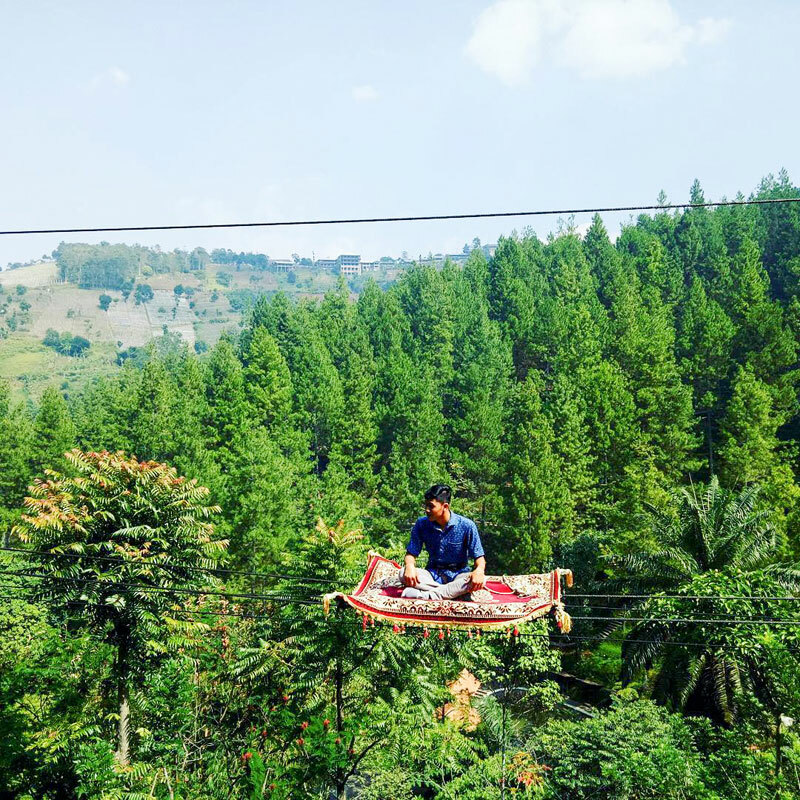 With the endless pine forest as your backdrop, feel the rush of adrenaline as the Aladdin carpet takes you up for a ride from one end to another. You’ll stop for a short while in the middle of the ride, but the secure safety gears will keep you safe while you pose for photos. If you purchase the professionally taken printed photos, the cables are edited out for that extra “floating in the air” effect, but of course, if you’re a seasoned Instagrammer, you’ll probably be able to do that yourself! 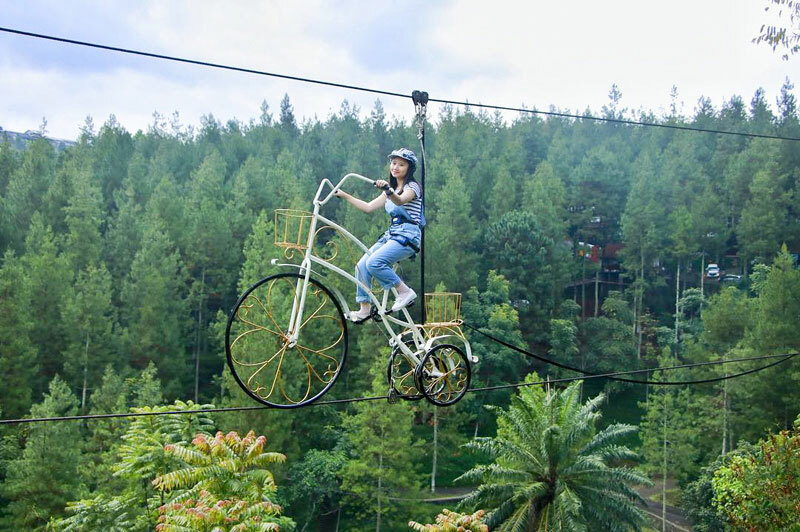 Pedal along as the Skybike takes you across the beautiful landscape of Lembang. 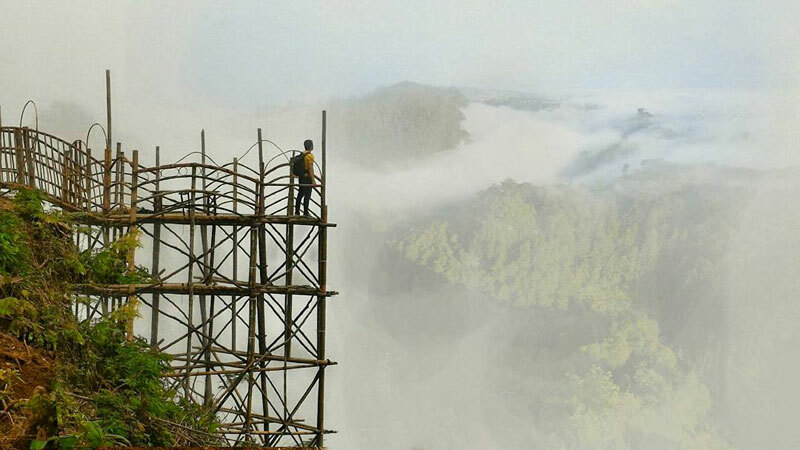 Don’t the panoramic emerald green forest and mountain in the distance appear so surreal in the mist? Putting a new spin on the classic snake-and-ladder game, Lost in Paradise is a labyrinth where you can trail the steps and go on the challenging slides. Surrounded by the blooming gardens in the maze, we’re sure it’s the kind of paradise you’d love to get lost in. Entrance Fee: Rp. 20,000 (approximately USD $1.50), car parking fee Rp. 10,000 (approximately USD $0.75). Ticket prices for different rides may vary from Rp. 20,000 – Rp. 40,000 (approximately USD $1.50 – USD $3). Glamping (otherwise known as glamorous camping) is a trend every family needs to get on. 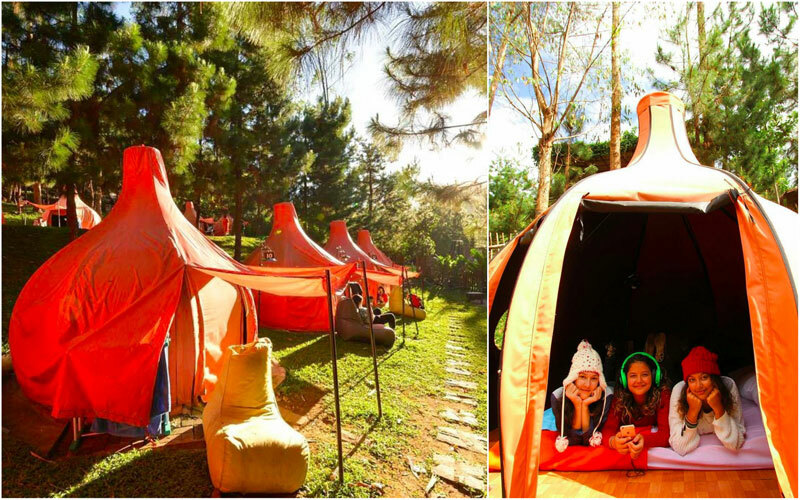 Not only can you introduce the awesome wilderness to your kids in style, but you will enjoy the lovely nature and keep the kids’ hygiene in check too! 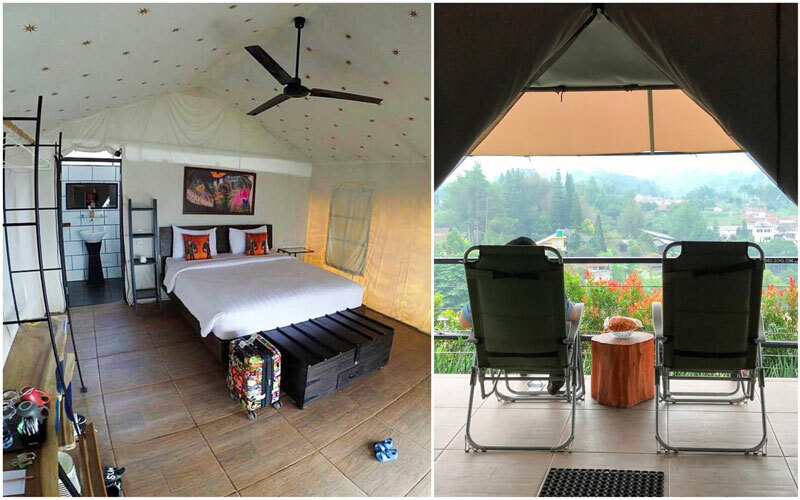 As one of the trendiest glamping spots in Bandung, expect a million-dollar view that includes the greenest pine forest on top of the Mariba cliffs at 2,080 metres above sea level. 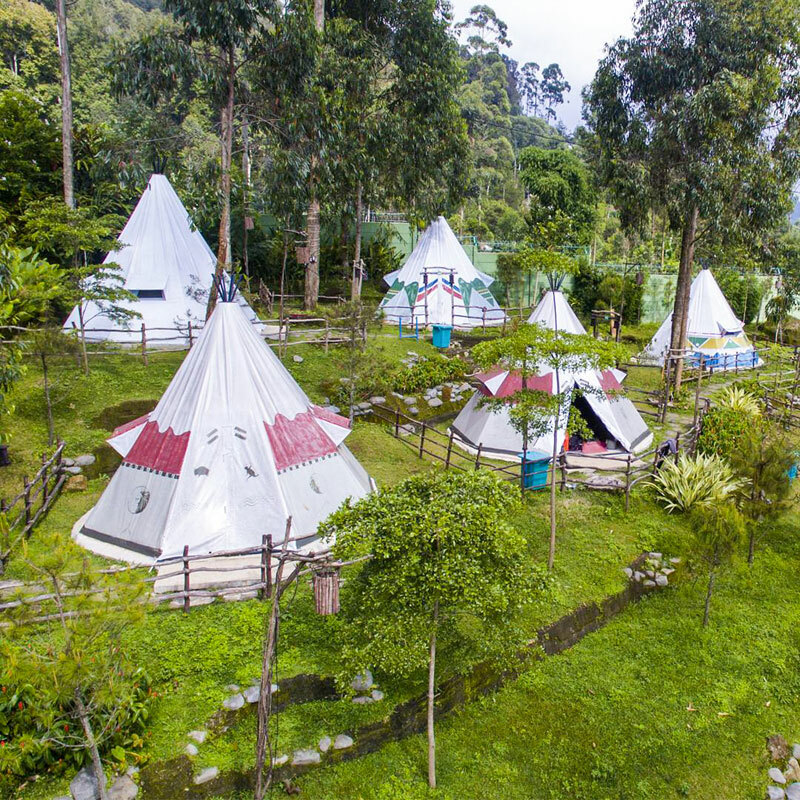 With individual tents in the most unique shapes, enjoy fire camps, barbeque, trekking, horse-riding and awesome culinary options nearby. 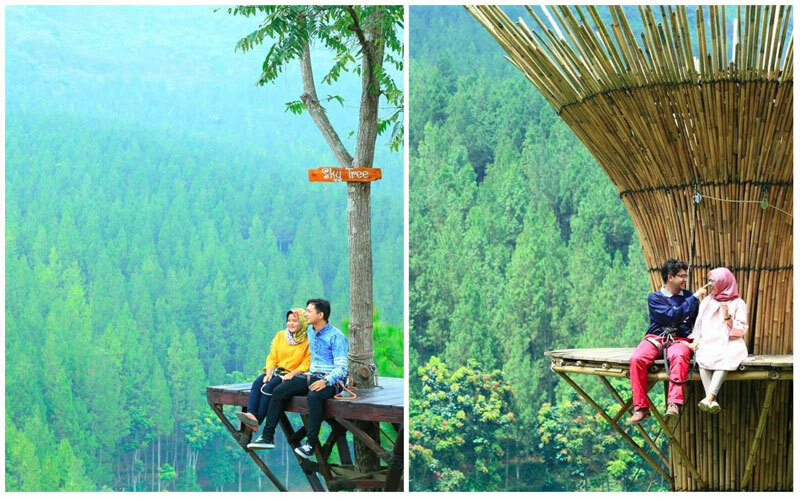 You also wouldn’t want to miss the Instafamous “Sky Swing” for that selfie with the gorgeous pine forest in the background. 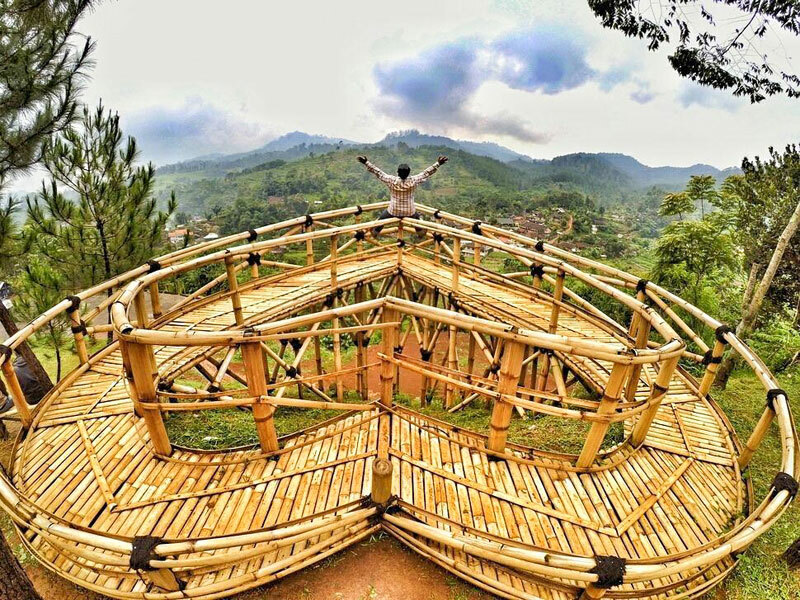 More extreme selfies await too at the Zip Bike and other platforms perched on top! 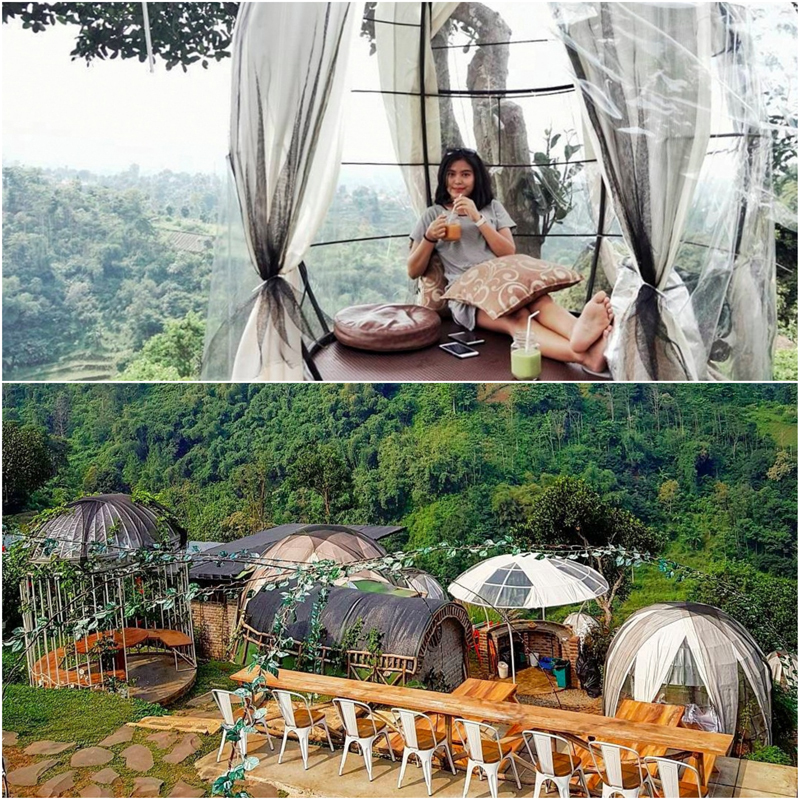 Located at the Rancabali Ciwidey, this glamping experience comes with a flat screen TV and furnished bathroom with amenities. 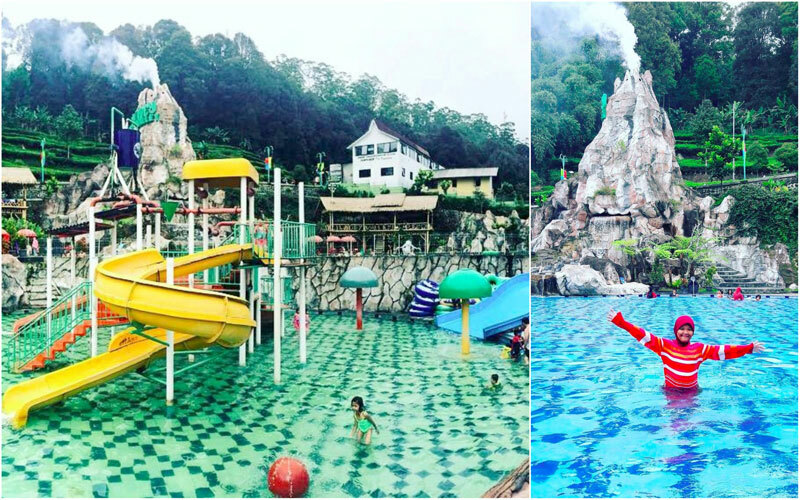 Decked in Apache style, choose the Camping Ground Family type and enjoy the hot pool, water splash games, slides, bird park, kids playground, and many more fun facilities! 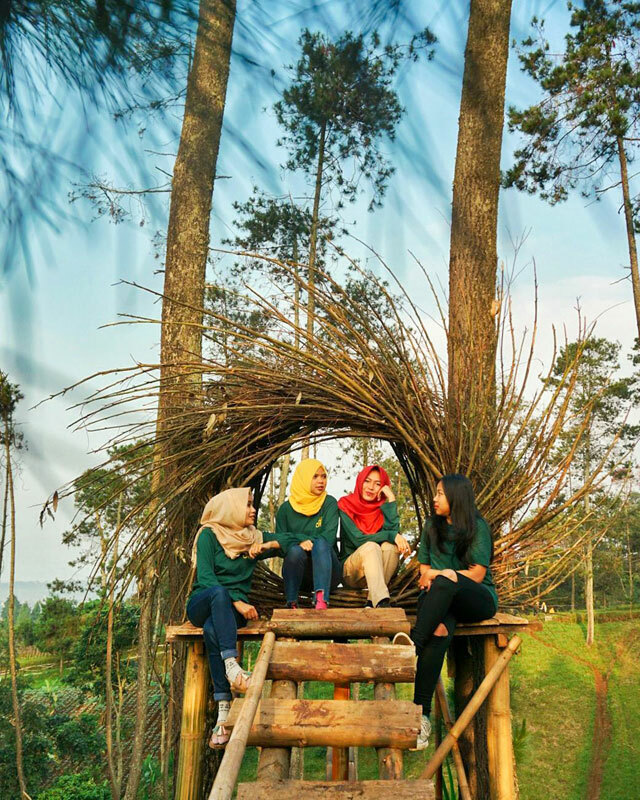 Located at the foot of Mount Lembang (around 1,400 metres above sea level), you’ll enjoy the company of hilly savannahs among the pine forest. The camps here are properly secured with cement and equipped with electricity. You’ll also be given sleeping bags, fire camps and some corn skewers for that authentic camping feels. Perfect for teens, we’d say! Address : Jl. 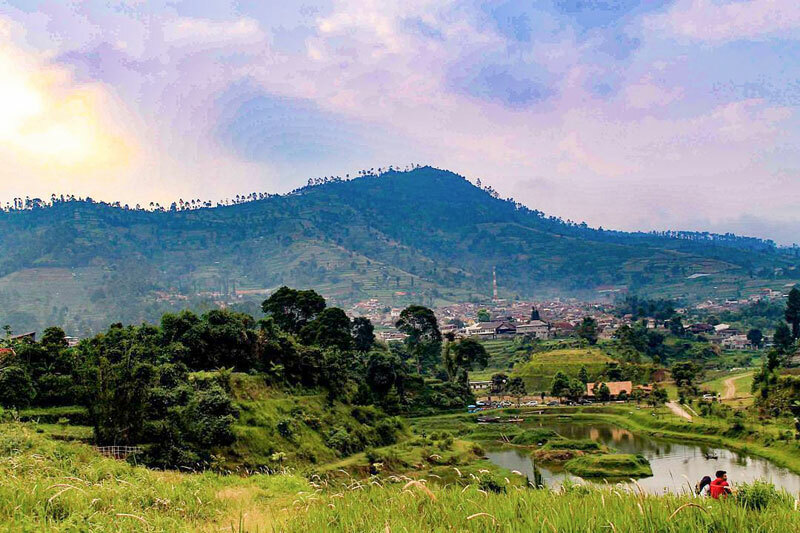 Tangkuban Perahu KM.8, Cikole, Lembang, West Bandung Regency, West Java 40391. 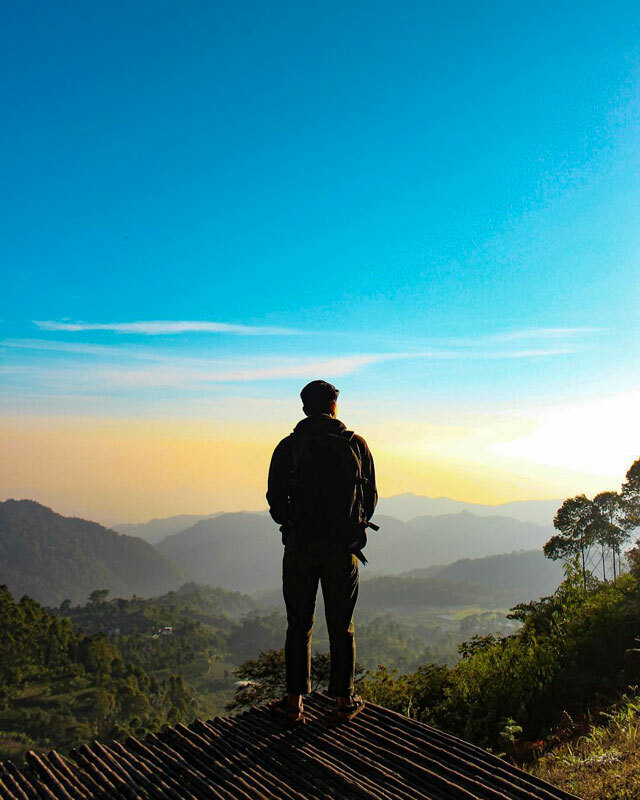 Wake up to the stunning view of the sunrise over the magnificent Mount Tangkuban Perahu. With 47 camps, these “tents” are actually hotel rooms in disguise, complete with comfy bedding, bathrooms and personalized service. Don’t miss out on the lovely decorations around this area for that Instagram #potd! 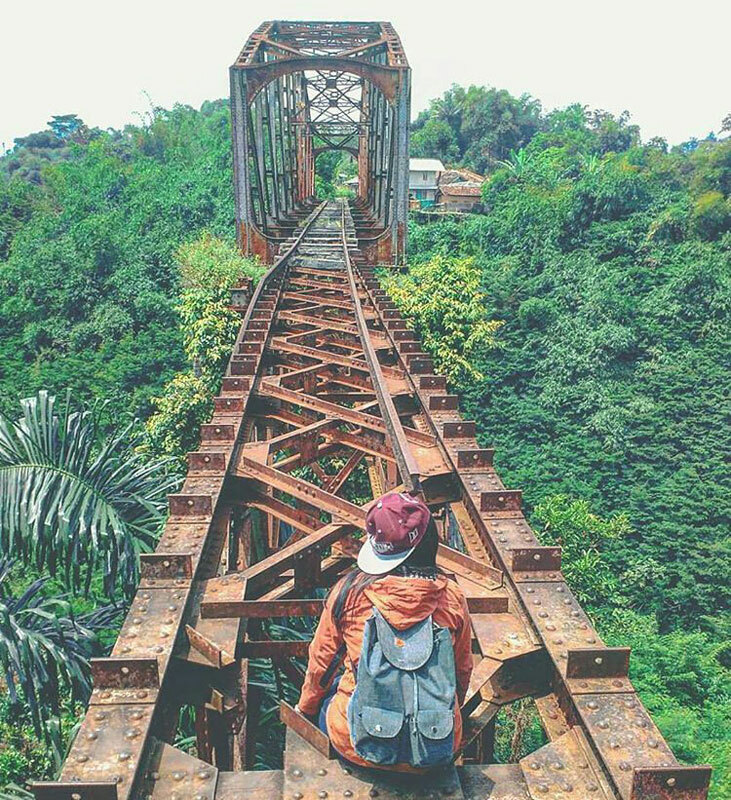 Have you seen selfies that people take on a scenic abandoned railway track? There is a certain romance to the vintage nostalgia and scenic view. 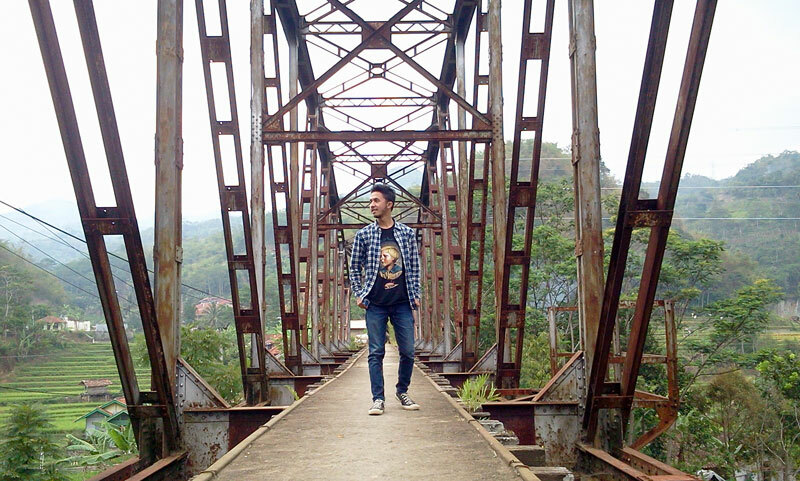 And you can find that in Ciwidey, in the famous Kawah Putih area! 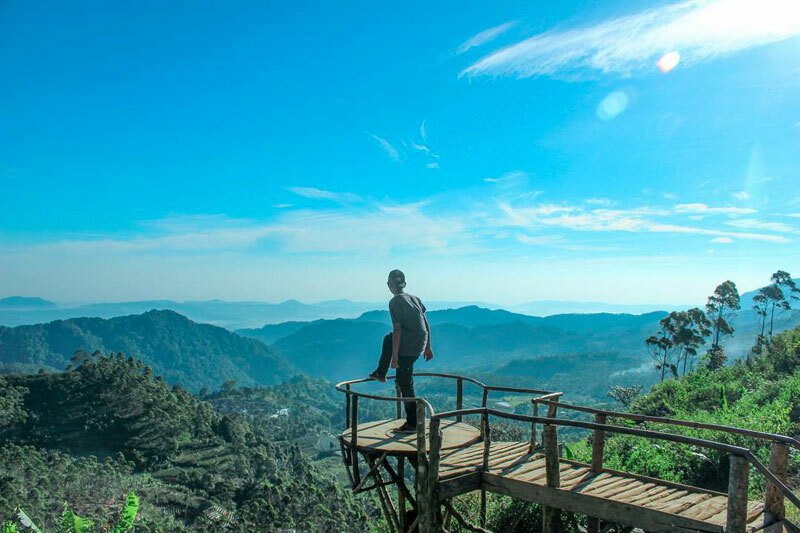 On the old tracks, you will be able enjoy peaceful views of the mountain panorama, tea plantation and a flowing river below. Your teens will love a photo here. Dating back to 1923, this 38-metre train track used to be the line for an Old Dutch transportation company until services halted in 1972. For decades, this spot remained trapped in time as nature took over. 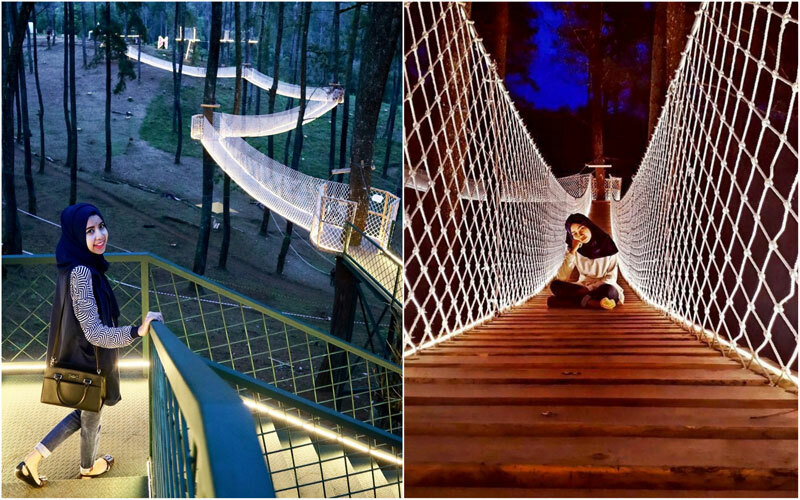 So you can imagine the delight among sharp-eyed travellers when they noticed this place for that Instagrammable selfie. Rumour has it that the government is keen to reactivate the railway line in an effort to reduce city traffic. Till it happens, better hurry! 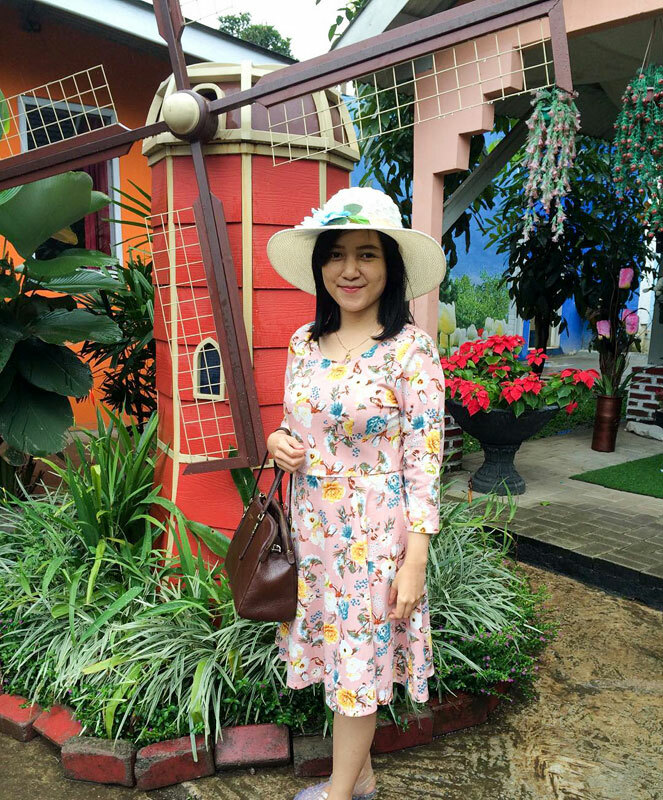 How would you like to enjoy a family day in a scenic cafe with whimsical vintage spots and great food? 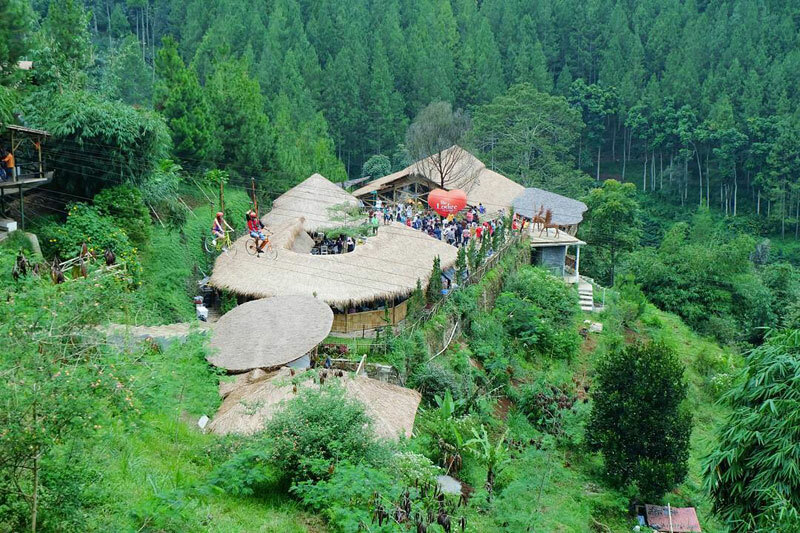 In the Ciumbuleuit area, Tafso Barn is making headlines as a must-visit culinary spot. 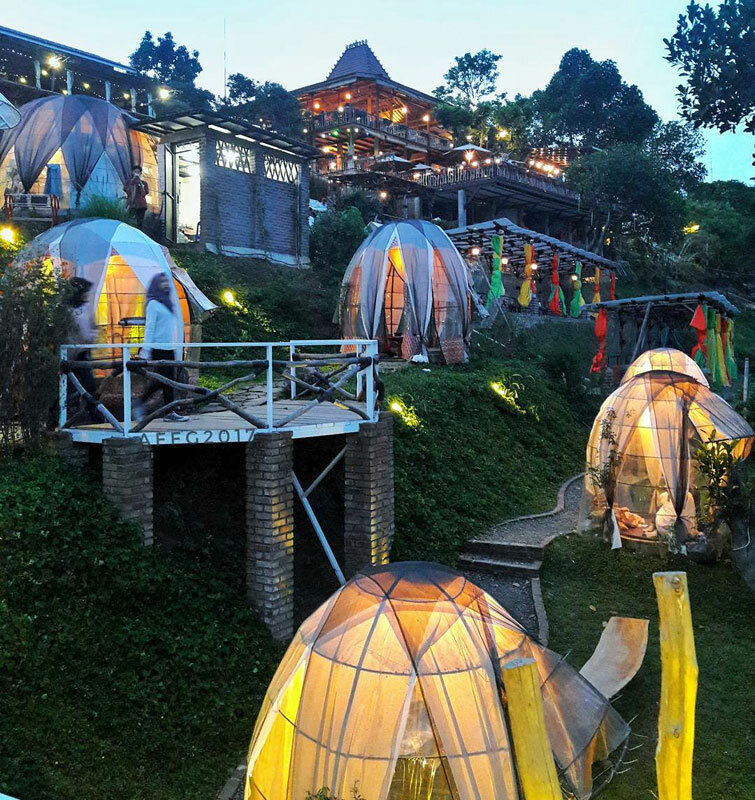 With a scenic view of Bandung, this gorgeous cafe houses a mini golf field, decorated human-sized white bird cages, vintage swings and cosy mini tents. This huge area is also divided into separate cafe sections with different concepts. Choose from the shaded tables in the garden or rustic setting with old barrels as props. 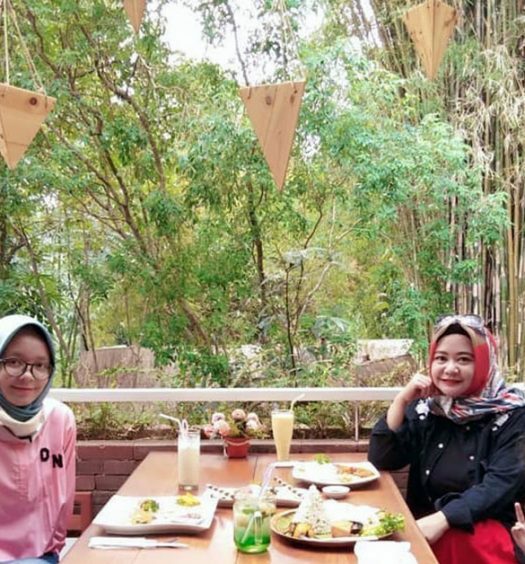 With an extensive menu from Indonesian, Western to Japanese cuisine, make sure your phone is all charged up – you’ll be snapping away too much before you know it. 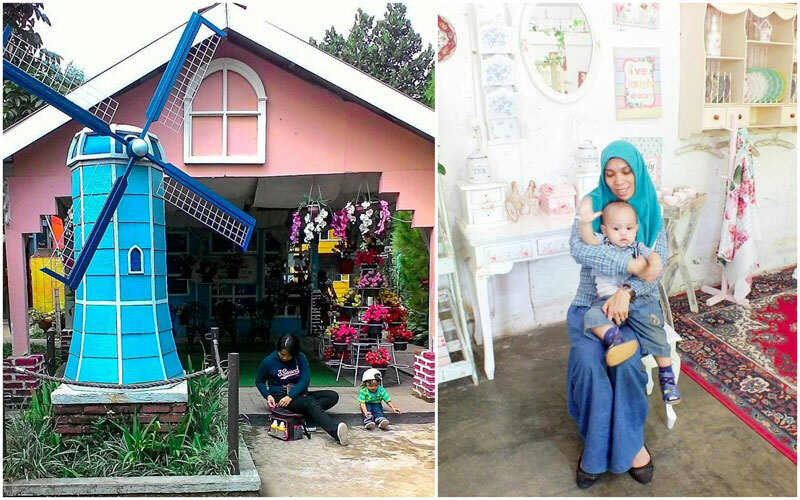 Bandung is known as Paris Van Java, but Kampoeng Tulip is all about a Holland lifestyle for the family. Don’t be surprised if you don’t see any tulip blooms. Despite efforts to import and plant the tulips, the flowers fail to grow. 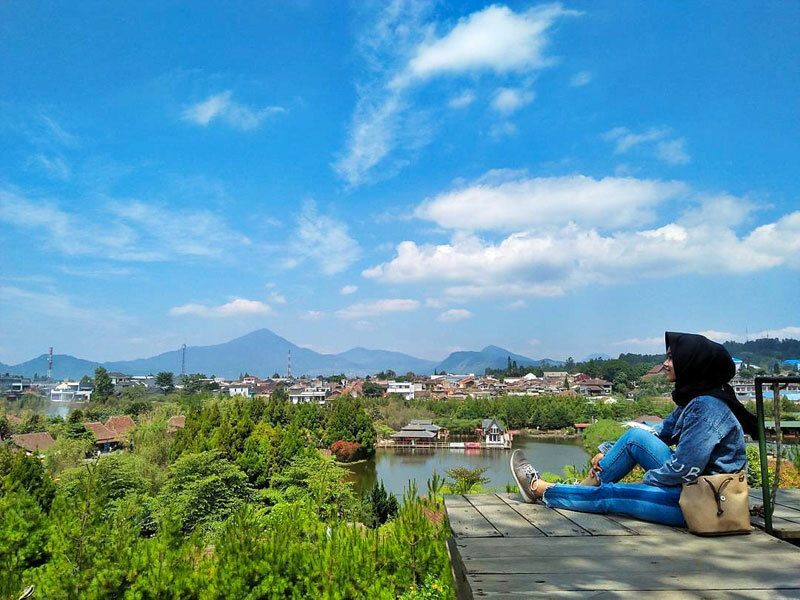 Still, Kampoeng Tulip will surprise you with its vast gardens complete with the most Instagenic natural views and exciting facilities. Take a stroll around the pretty spots adorned with iconic Dutch windmills and shabby chic little houses. 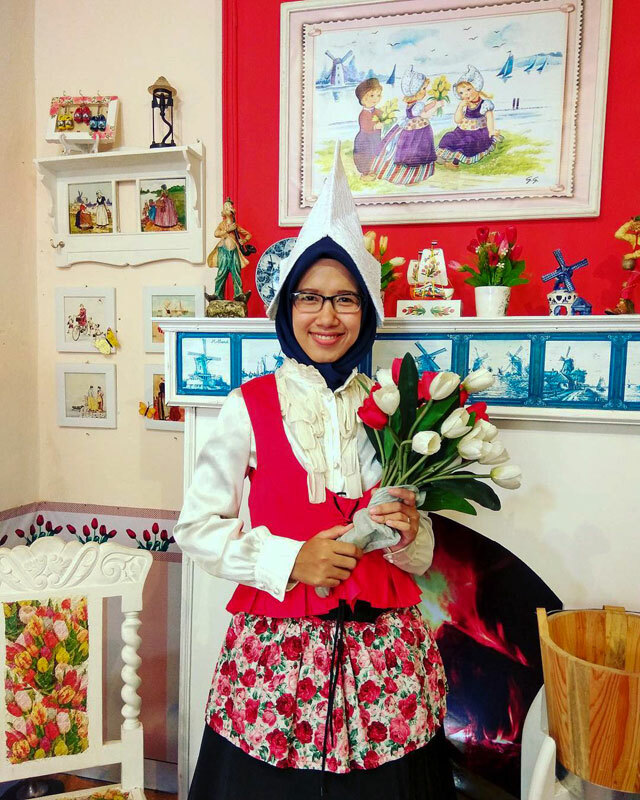 You can even don a traditional Dutch costume and pose for fun! 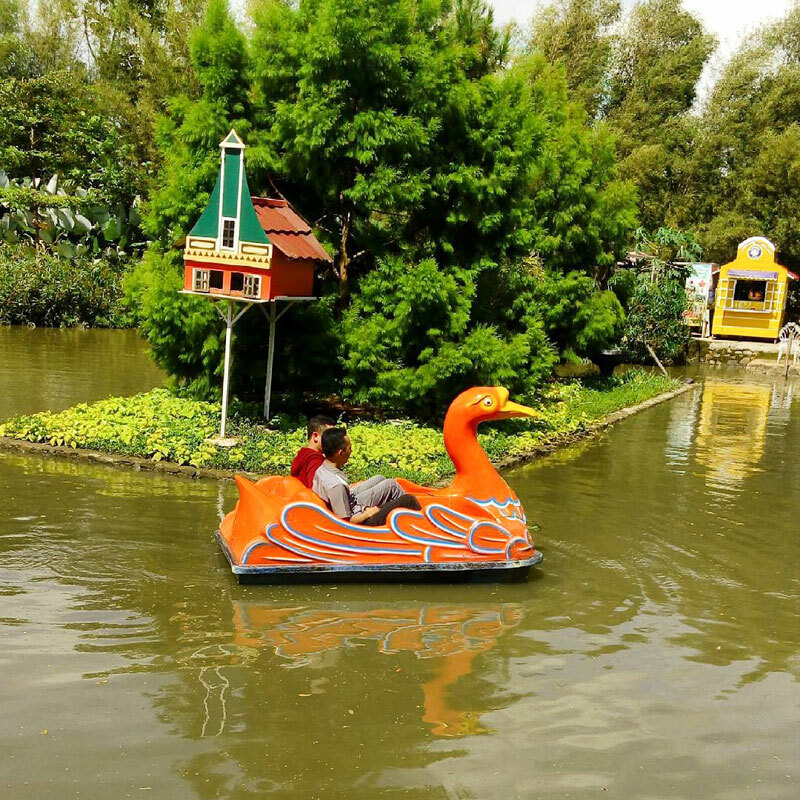 Your kids will be thrilled to jump into the little boats, while you row around and admire this charming place. Entrance Fee: Rp. 8,000 on weekdays (approximately USD $0.55) and Rp. 12,000 on weekends (approximately USD $0.82). Boat rides are free. 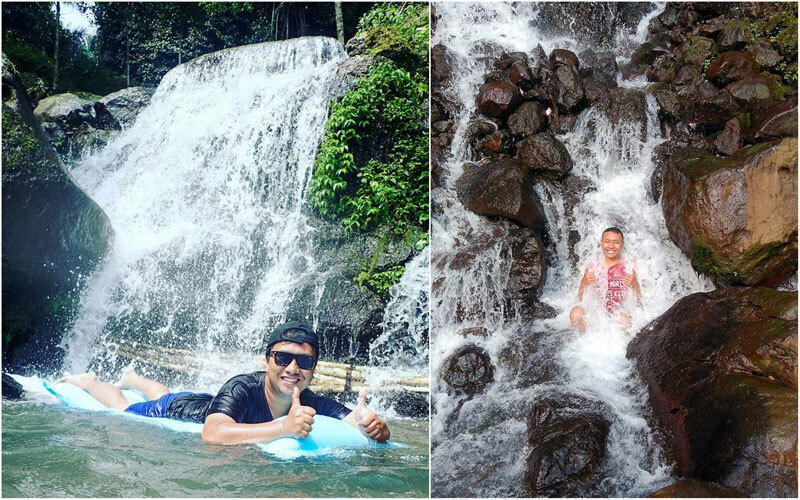 Nothing heals the soul and strengthens family bonds more than being in the comfort of nature. 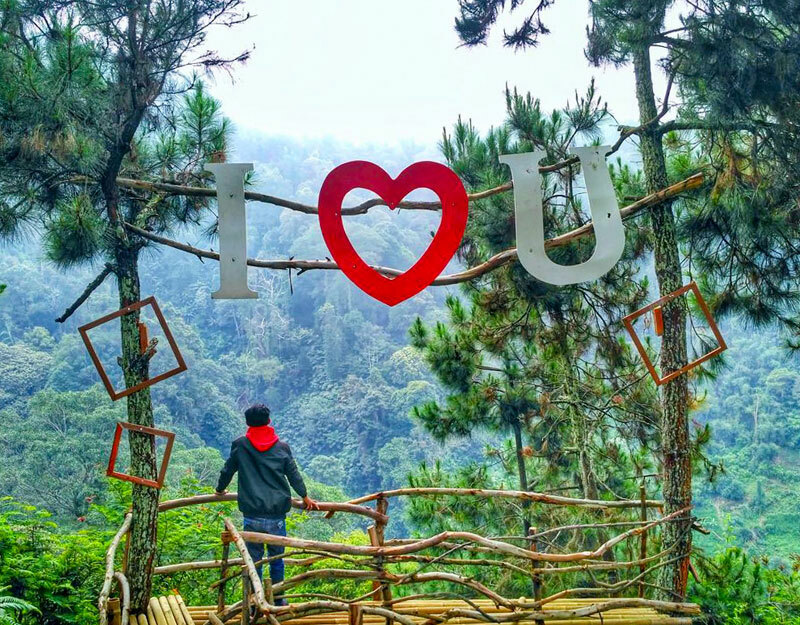 And Taman Lembah Dewata (or otherwise known as The Valley of Gods) will do just that. 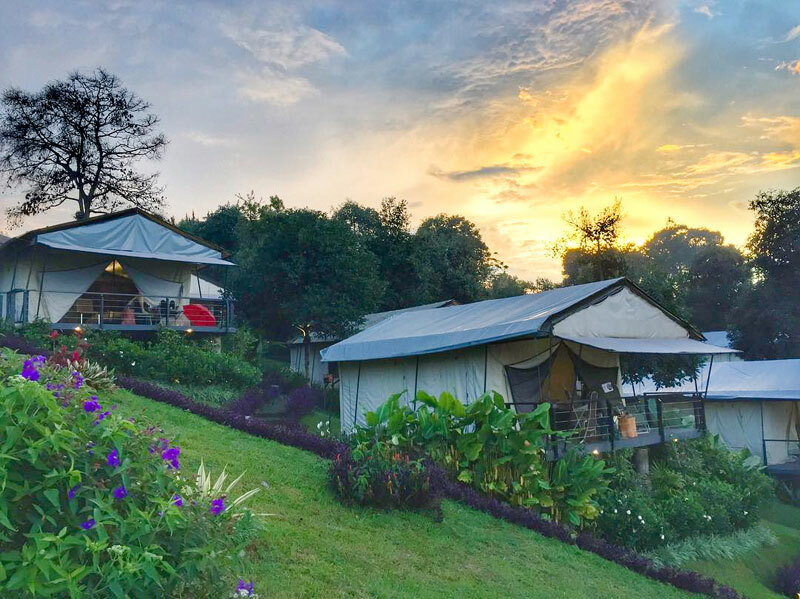 Located in the popular tourism spot of Ganesha Equestrian, its unrivalled beauty will stop you in your tracks as you stop to marvel with your family. 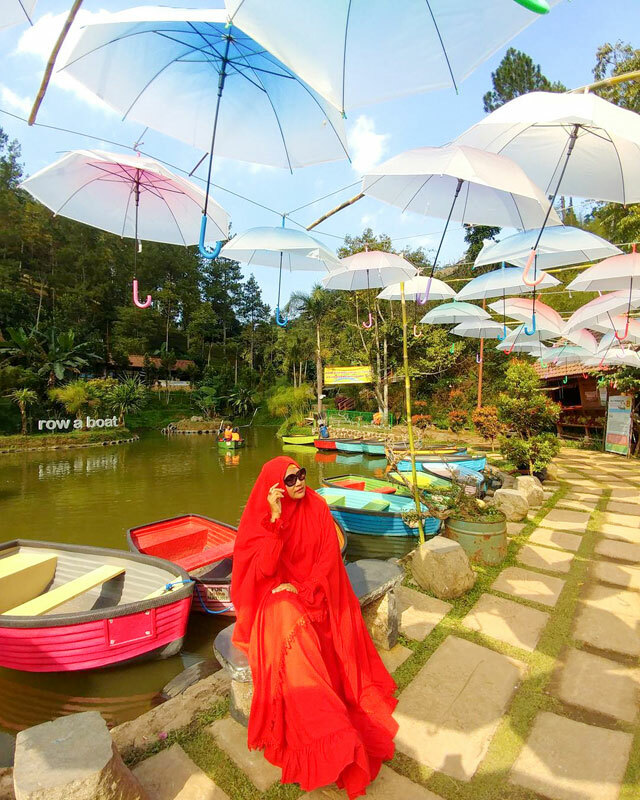 The main attraction is the absolutely breathtaking Danau Tadah Hujan (Rain Lake). 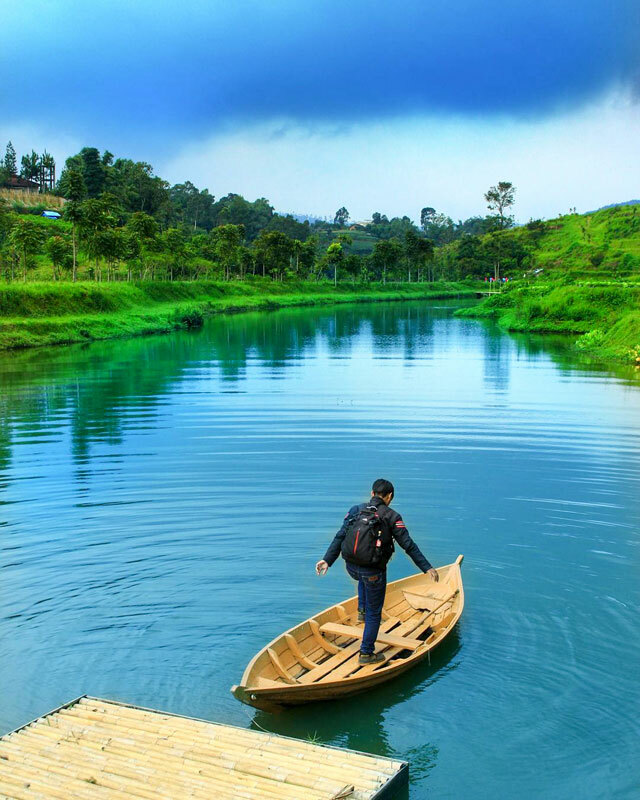 Surrounded by lush green hills and under the blue cloud-speckled sky, you can either take a small boat for a spin or sit on the bamboo deck to enjoy this flawless view. 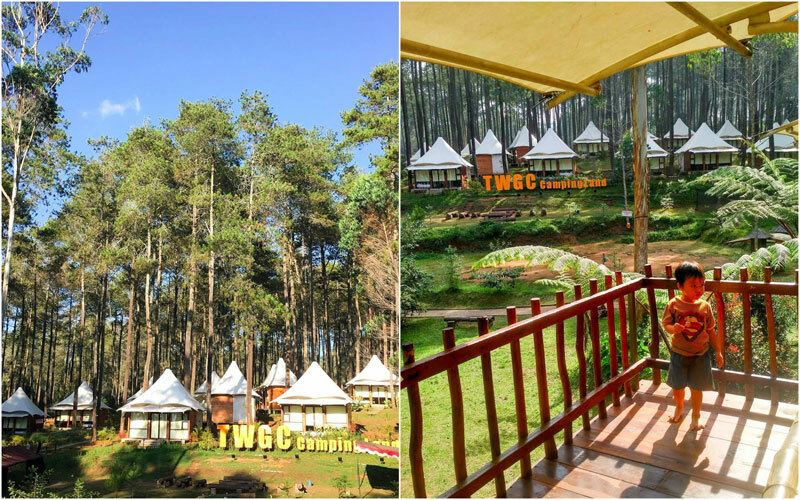 In the green landscapes of Lembang, you’ll find an extra refreshing spot lined with rows of pine trees and a refreshing view of the tea plantation. 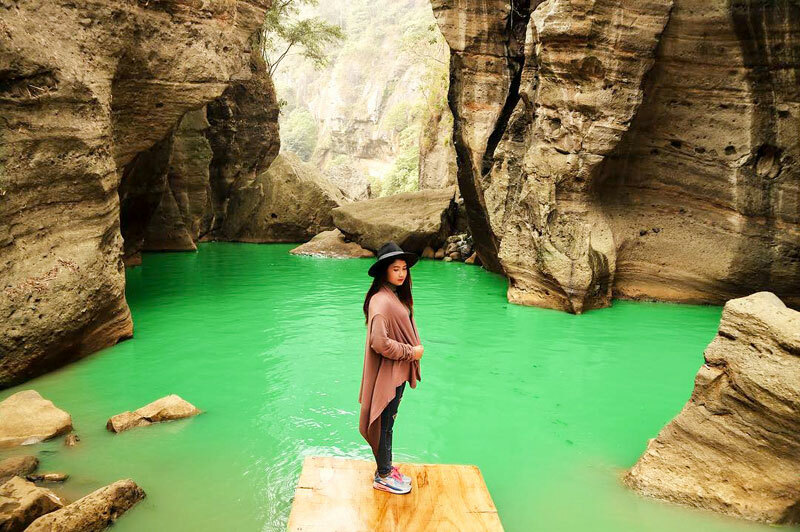 This all-green atmosphere is not only Instagrammable, but also brings a sense of tranquility that slows you down and calms your senses. 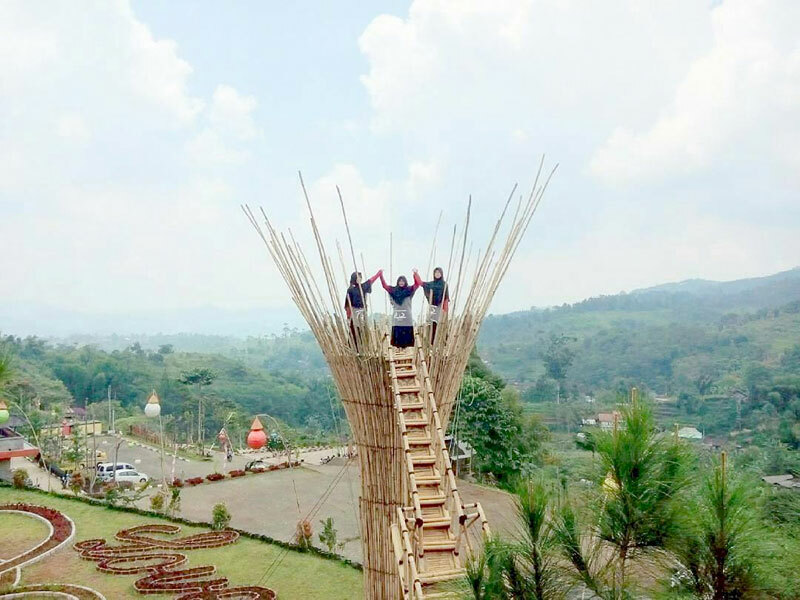 Complete with photogenic platforms, you’ll find a bamboo boat near the valley, where you can get a unique perspective from the top of the Lembang hills. With a blanket of thin mist shielding this place, this exotic location is also most favoured as a sunrise or sunset spot. 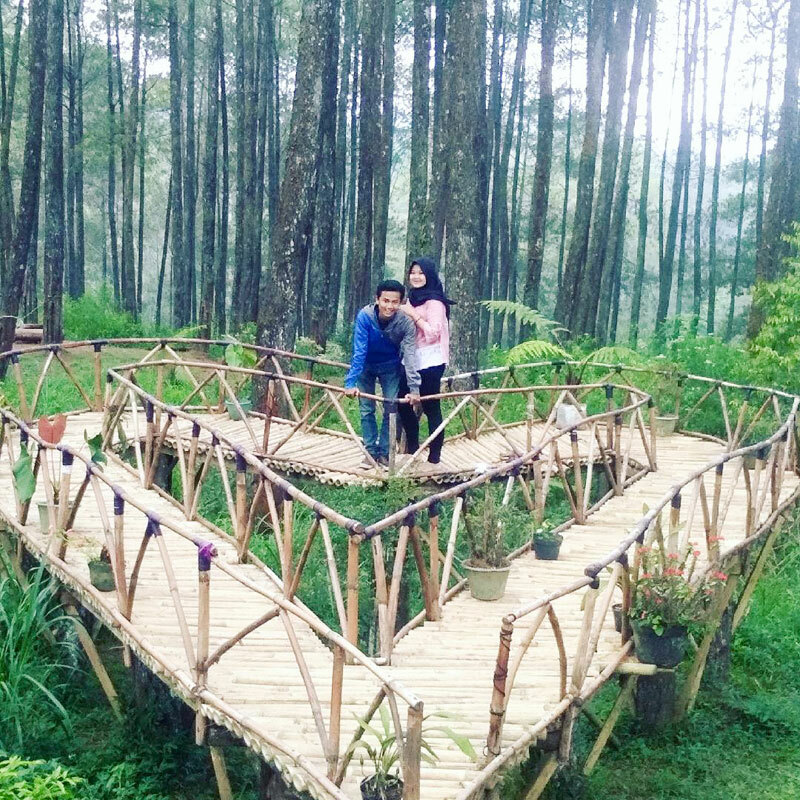 So secure yourselves a good seat and get lost in the blissful green nature of Eurad Pine Forest. 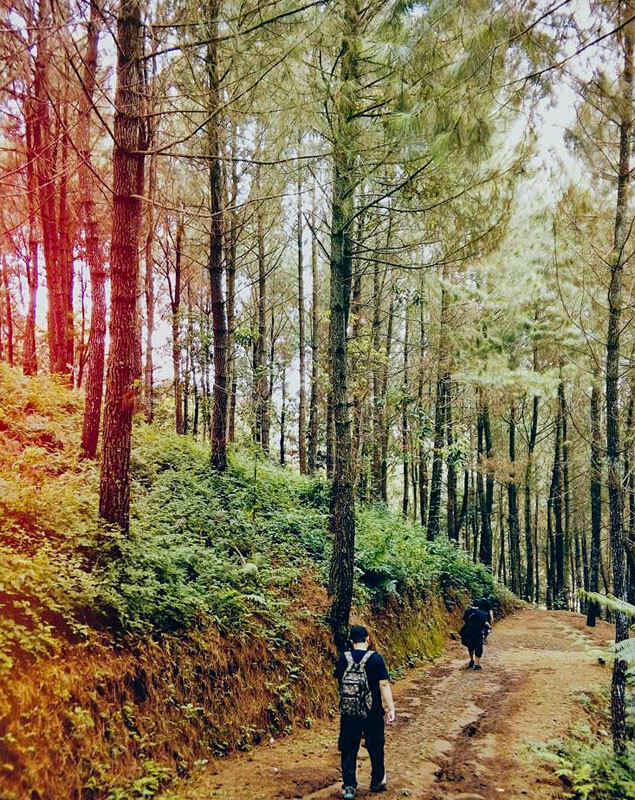 Getting there : Pass Pasar Ahad and head to Cikareumbi, and you’ll reach the pine forest in no time. 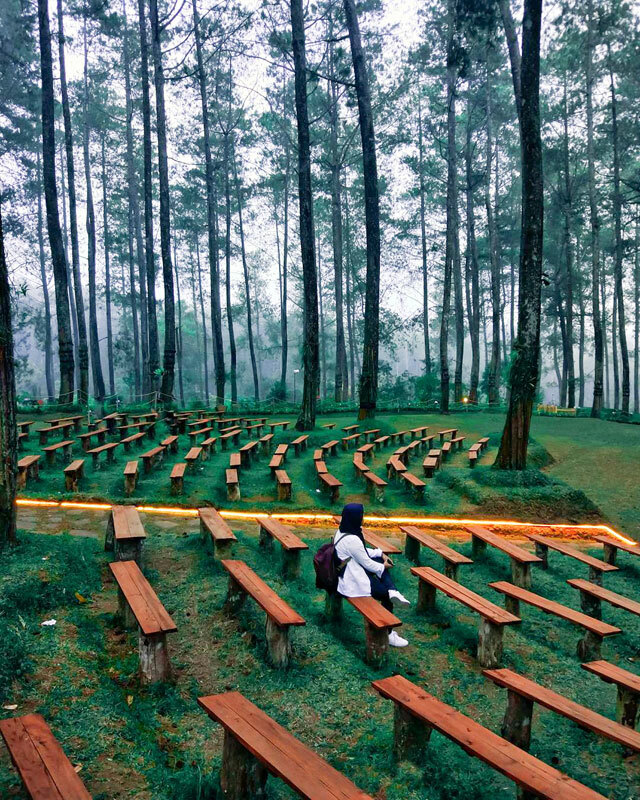 Formerly under a long Dutch colonial rule, Bandung has no shortage of unique and mystical remnants with hidden mysteries that we have yet to fully uncover. 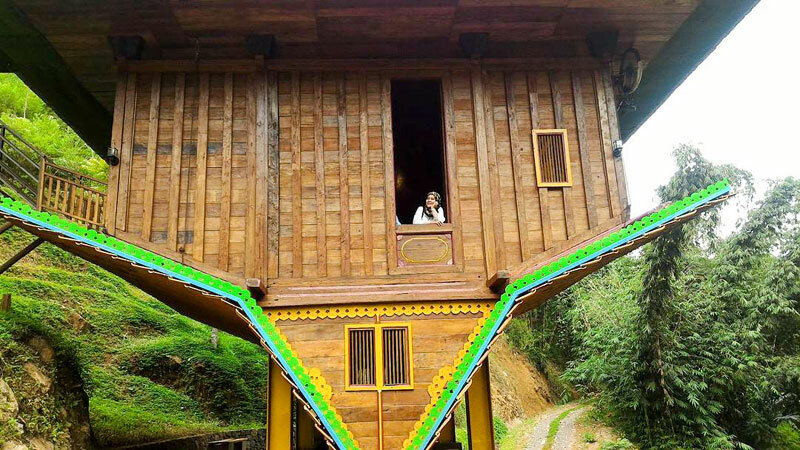 At Kampung Pasir Ipis, an intact one kilometre-long Dutch fort stands majestically and is believed to have been built in the late 19th Century. With moss-covered walls and dark windows that sunlight barely penetrates, you’ll get the sense that this place has been untouched for a very long time. 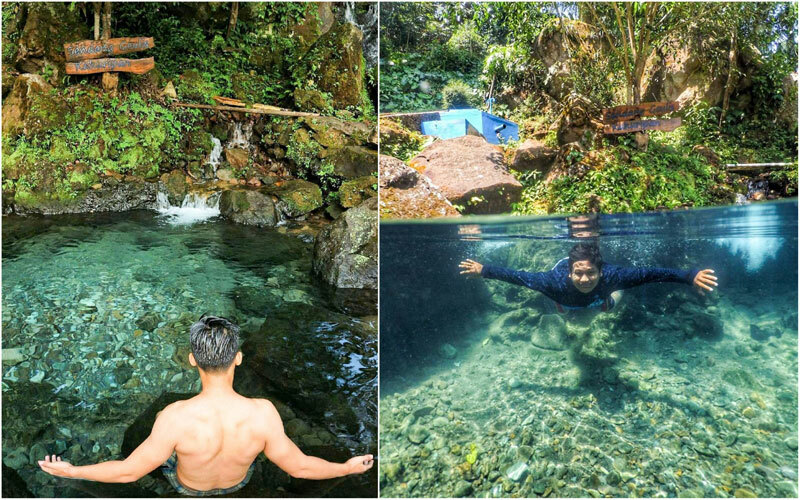 As you trail further down, you’ll hear the trickling of a small waterfall, along with the melodious sound of birds flying above the green jungle. 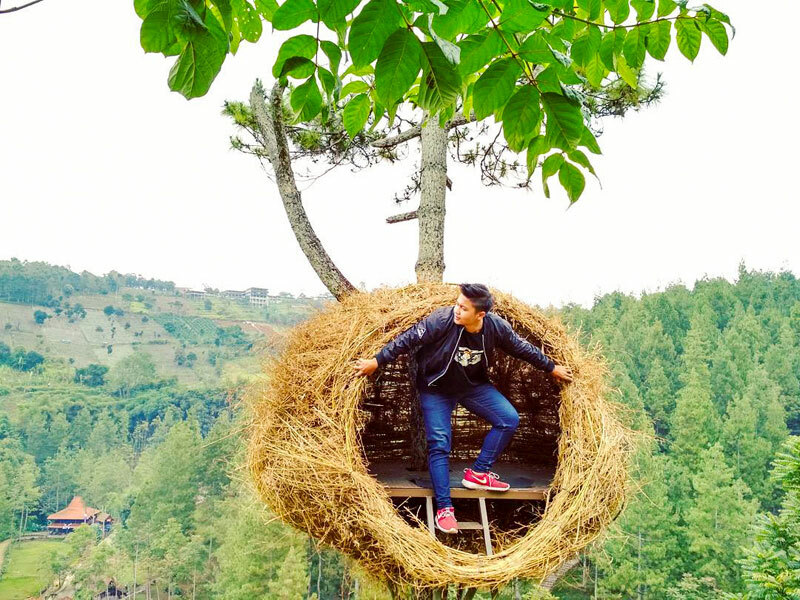 While you’re there, check out other Instagrammable spots as the giant bird’s nest and the tall deck for that glorious bird’s eye view on top. 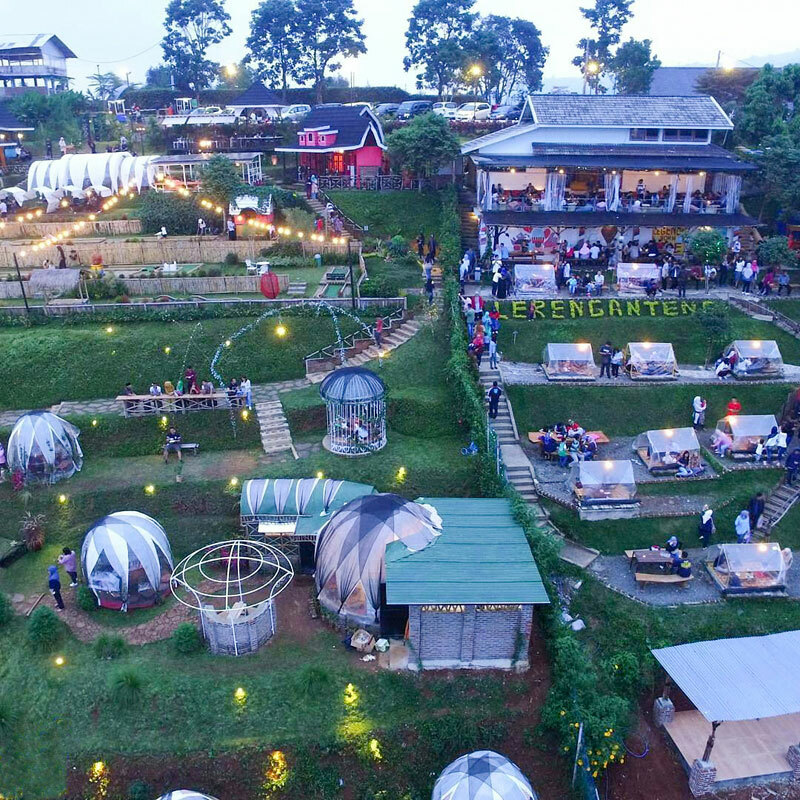 Getting there : Before entering Pasar Lembang area, you’ll see a small road near a restaurant named Mandarin. Follow the path and ask the locals for directions to get to the fort. 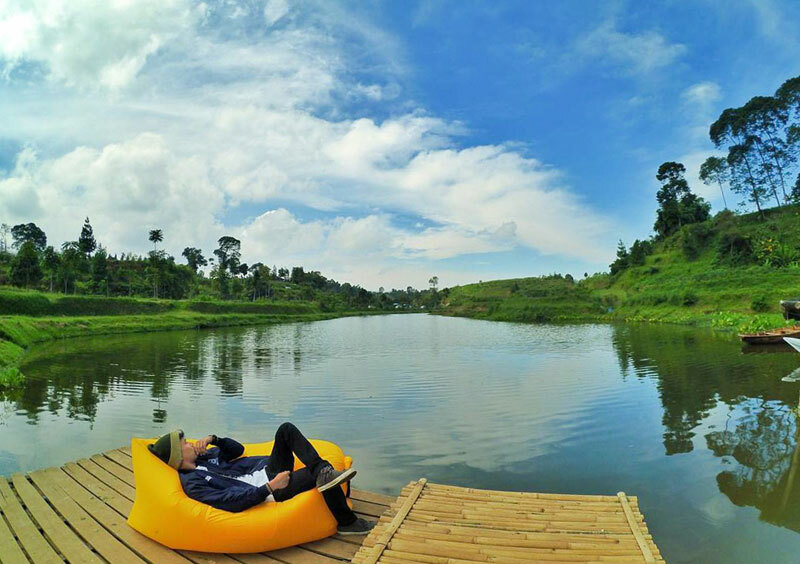 This Insta-darling spot goes by many names, such as Cikahuripan pond, Sirah Cai Kahuripan, and many other variations. 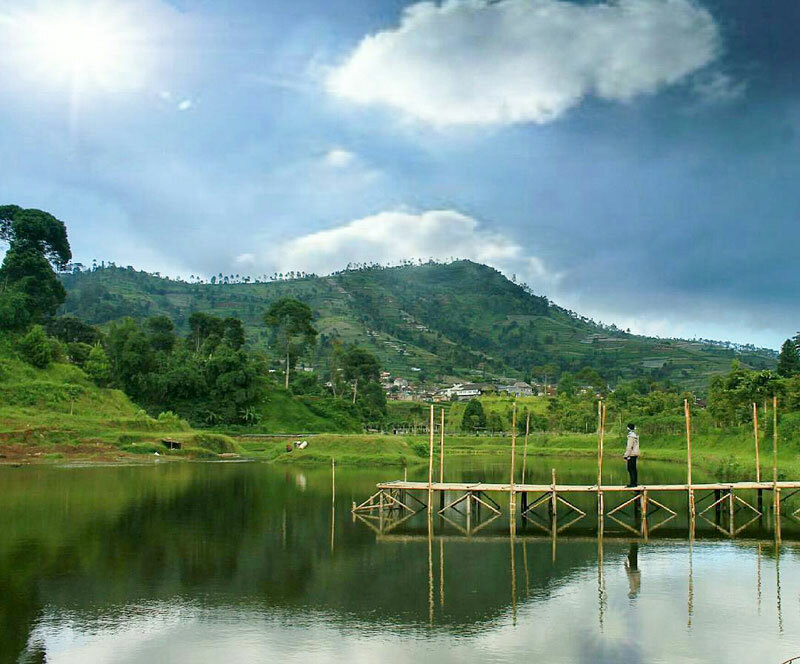 But the most popular one is Sendang Geulis Kahuripan, which loosely translates to ‘the life-giving pond in the middle of the mountain with the most beautiful view’. That translation fits perfectly! 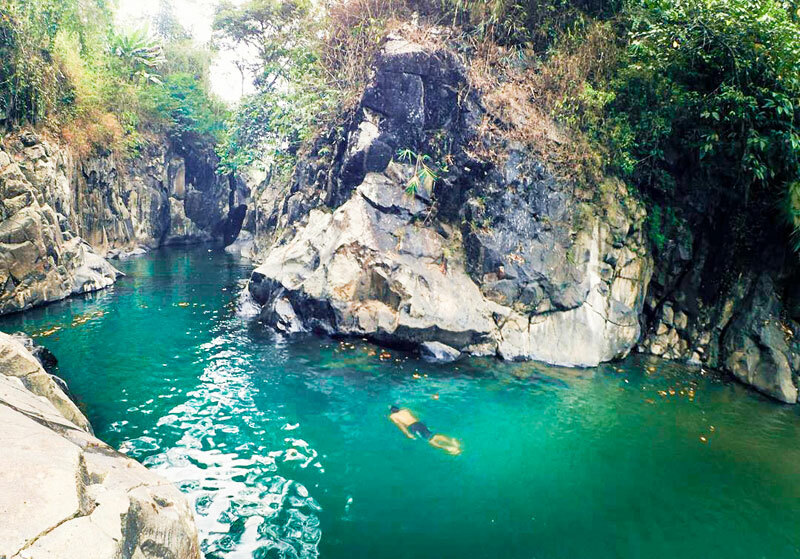 The crystal clear water pond is surrounded by verdant greenery and located in the midst of the hills. It is also used by the locals as a water source for their daily needs. 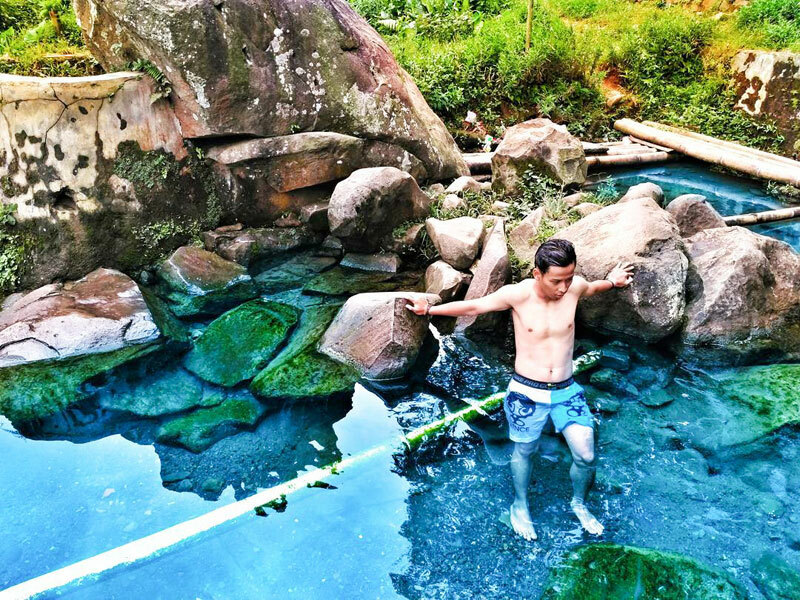 It is also said that the refreshing water has healing and beautifying effects, which makes it very popular for all types of travellers, including families. Isn’t it lovely to bring your kids here for a soak? 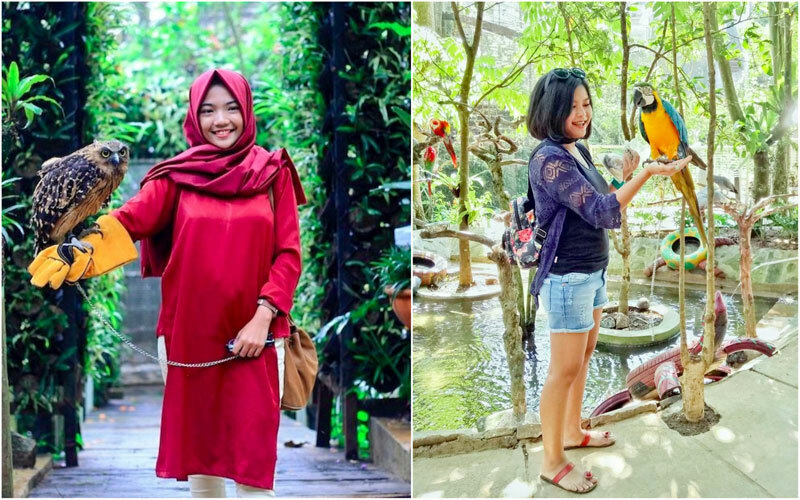 Getting there : Take the Cikampek-Padalarang route until you reach the Cikalong main street. 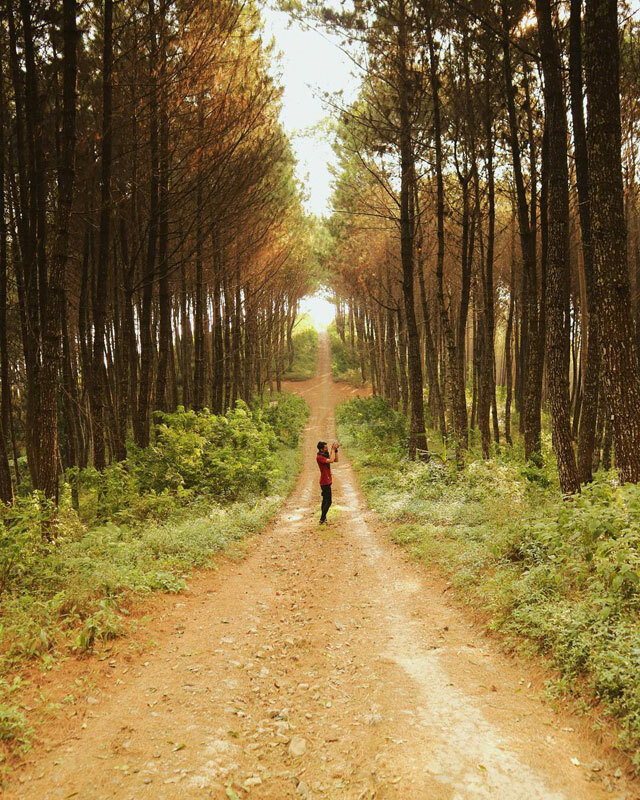 Take the right path from Cikalong Wetan for about 3 km until you see a trijunction. Continue for about 4 km to reach the pond. 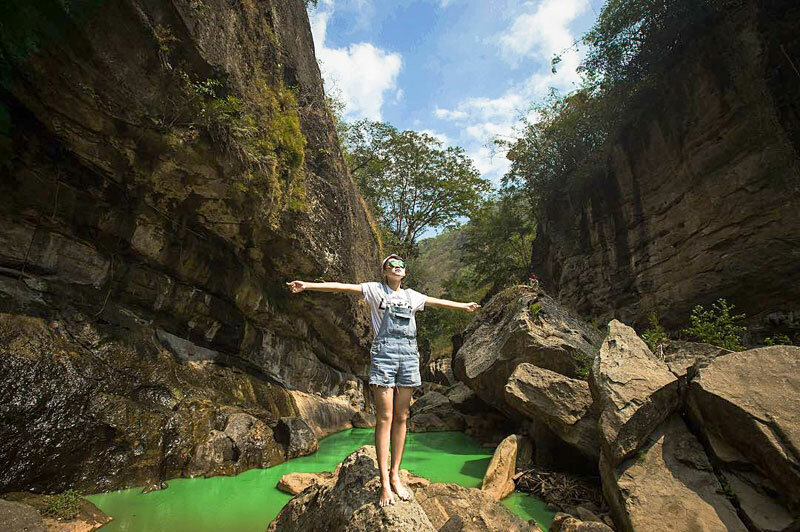 Have you heard of Cikahuripan river’s hidden canyon, located just one kilometre away from the entrance of Cikahuripan tourism spot? The path is dominated by giant rocks all the way up the two towering cliffs of 10 metres high, spreading up to 100 metres wide from one side to another. 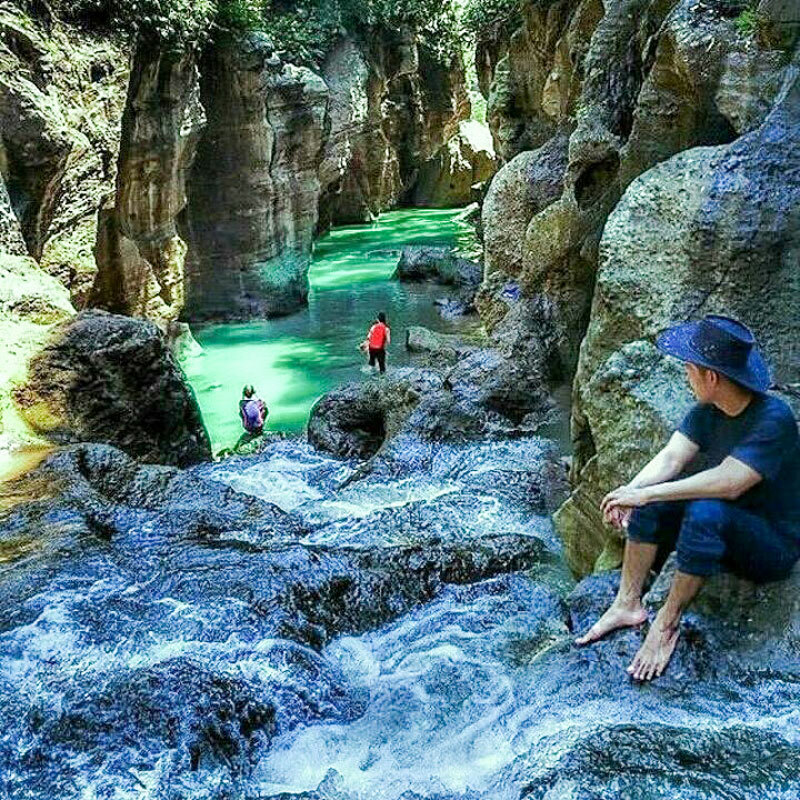 Wedged between the fossil cliffs is a small beautiful river of Cikahuripan. Its water glistens in the distance, creating an inviting body of crystal turquoise pond. 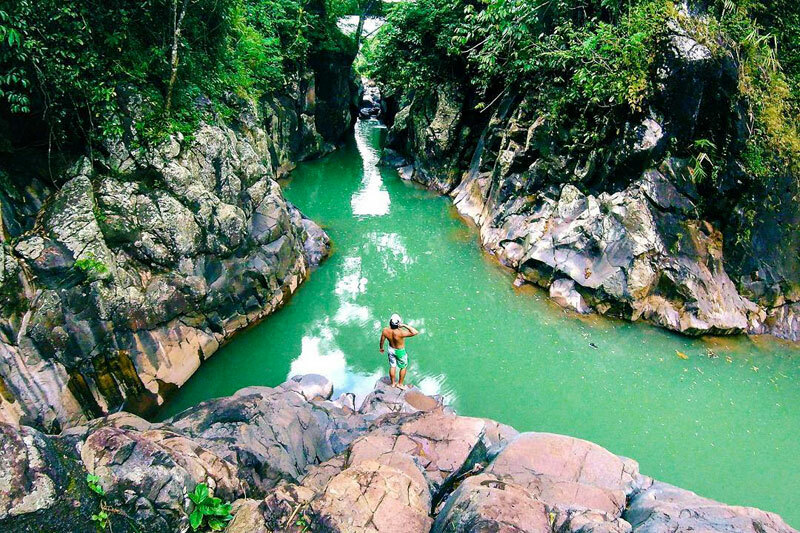 The water goes as deep as 4 metres, but some rocky spots are shallower, so you can enjoy it with your family. Getting there : Get to Rajamandala, Padalarang, then turn left to Waduk Saguling. 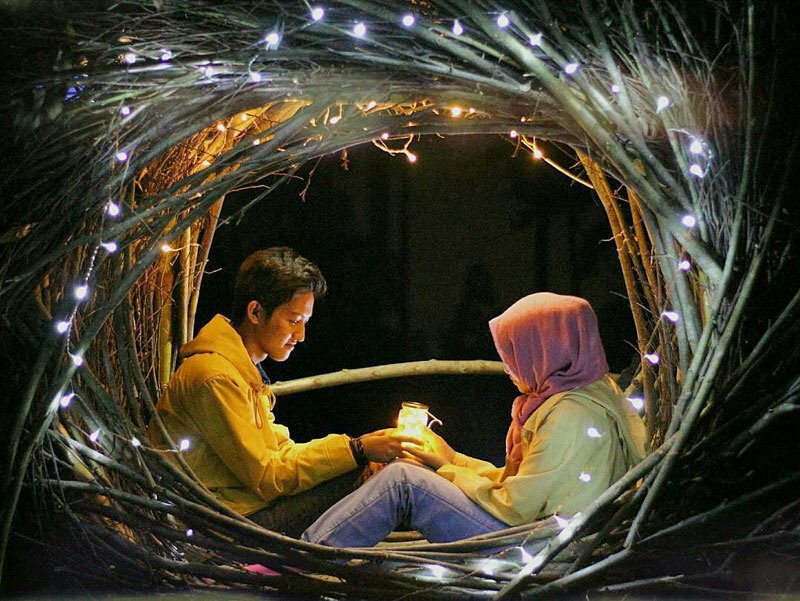 Take a right turn at the last trijunction before Waduk Saguling, and you’ll soon see a small warung with a sign ‘Wisata Cikahuripan’. Continue by foot for around 1 km. 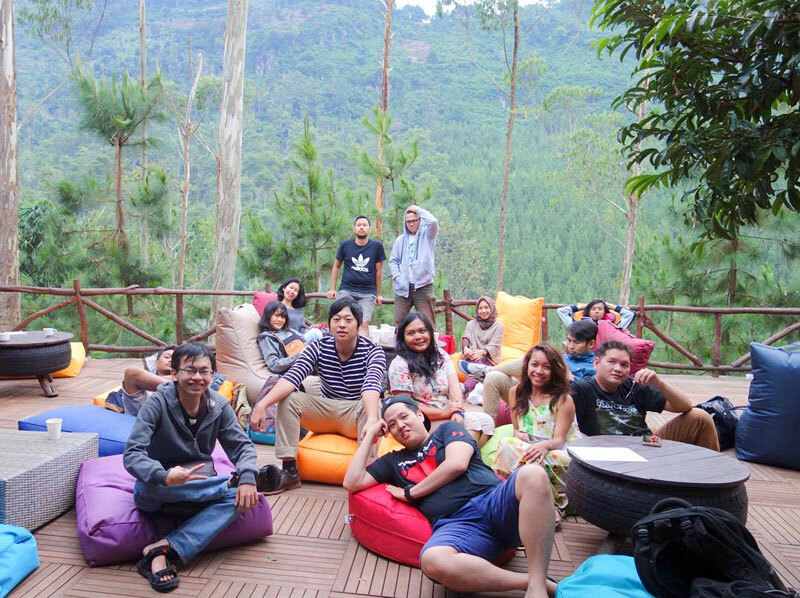 Located in Garut, which is two hours’ drive away from Bandung, sits a hidden canyon, Leuwi Jurig. Its name may mean ‘The Satan Pond’, but its beauty will make you believe in the higher powers. 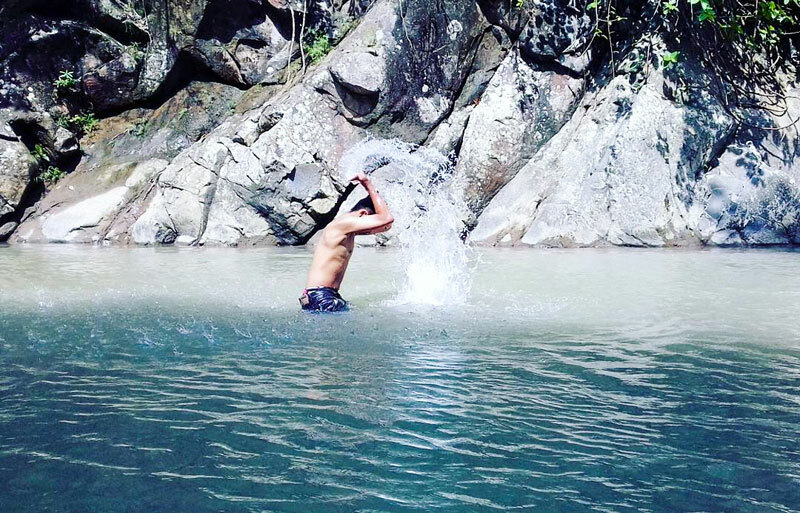 Locals believe that bathing in the pond will free you from all bad luck, thus the name. 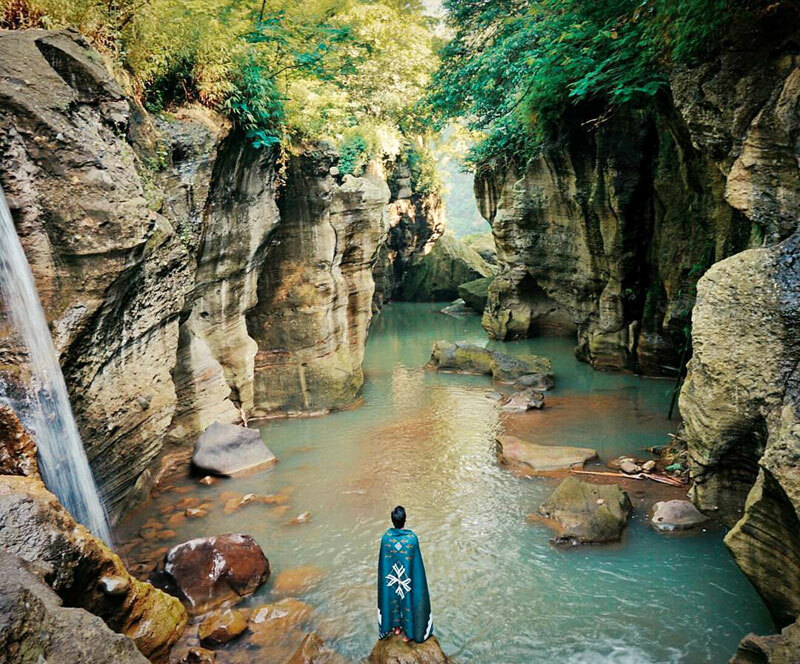 Streams of fresh water flow through the exotic cliffs all the way down into a luscious emerald green pond. Its beauty has been likened to the Grand Canyon of Arizona, because it is that gorgeous! 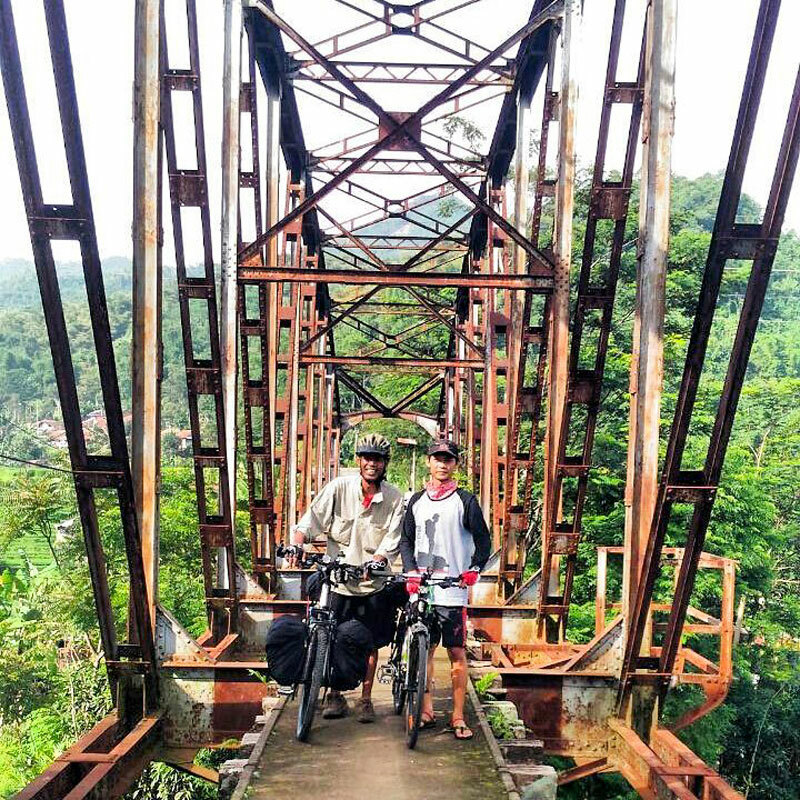 Getting there : From Bungbulang, Leuwi Jurig located is near Sasak Rumpit (Rumpit Bridge), the first bridge that you’ll pass after Cirompang Bungbulang power plant. Price : No entrance fee, only a small parking fee is required. 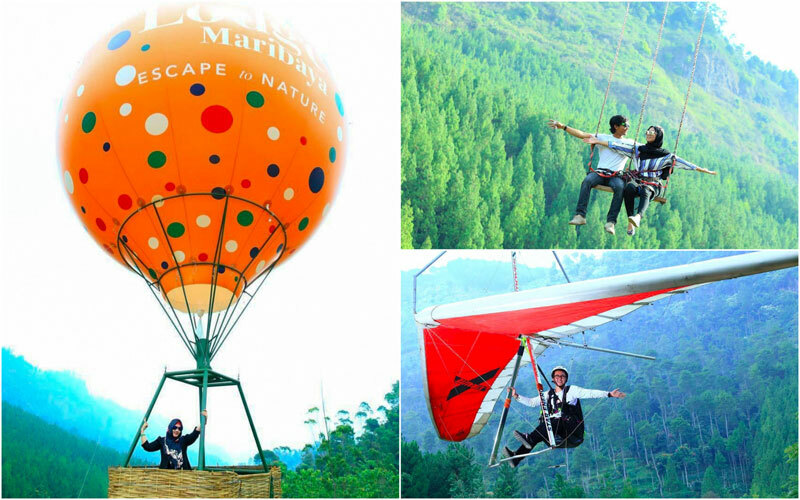 Have we given you enough reasons to visit Bandung this weekend? Just make sure your camera batteries and power bank are charged, you’re gonna need it for sure! 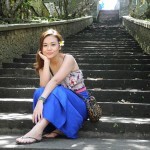 I relish on traveling and writing, as they are the perfect wanderland. One takes your flesh; the other your mind yet both are intertwined in almost all possible ways. This rich combination is what fuels my passion, spirit and energy. 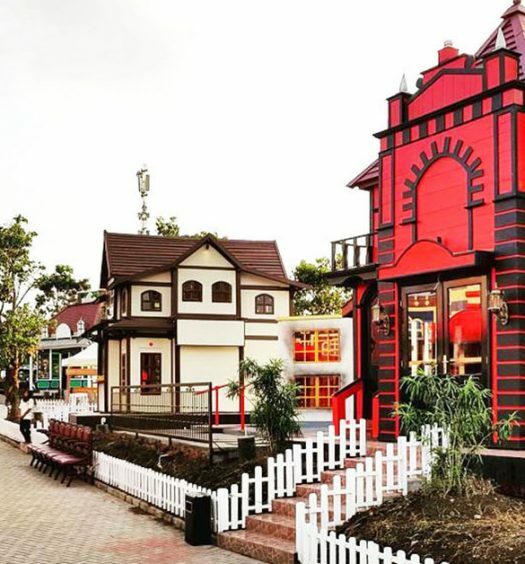 13 reasons why your kids will love the European town of Kota Mini in Lembang (Bandung)!